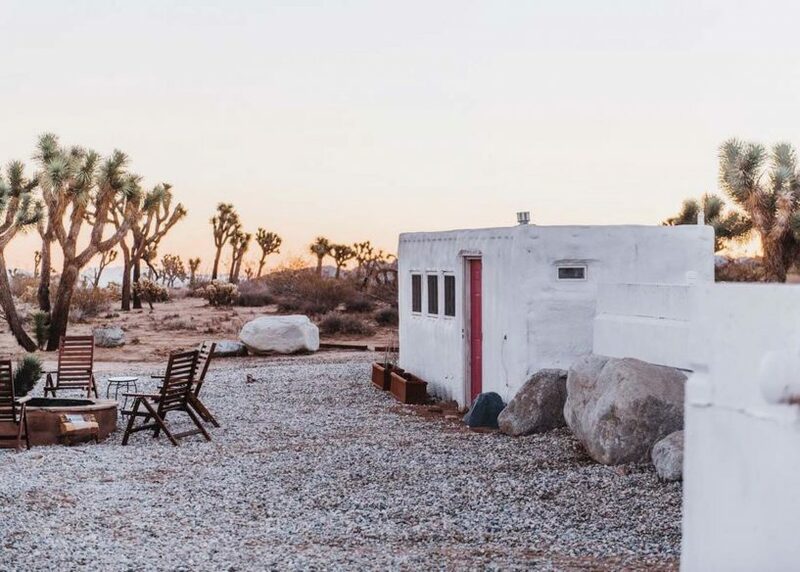 Joshua Tree is a bohemian wilderness of otherworldly landscapes and esoteric vibes, which has lately become a hotbed for hipsters looking to escape the urban grind. 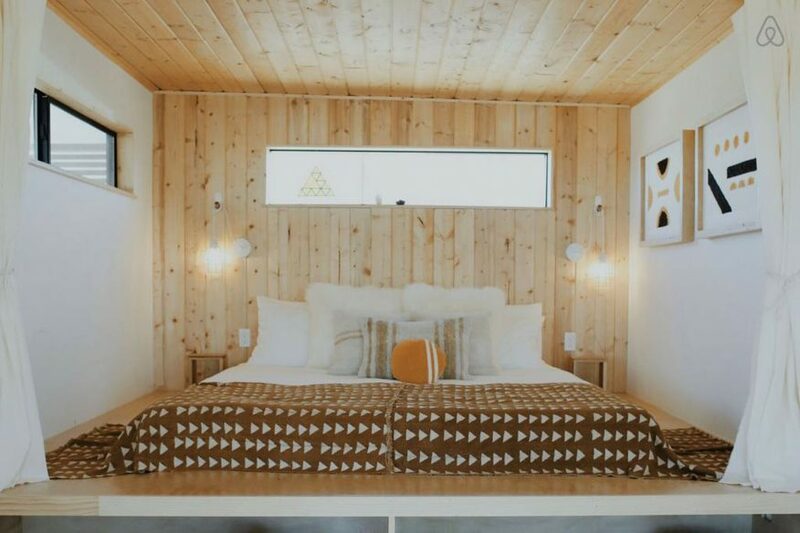 Artists and the design-conscious are setting up home and creating an array of stylish cabins, many of which are available to rent on AirBnB. 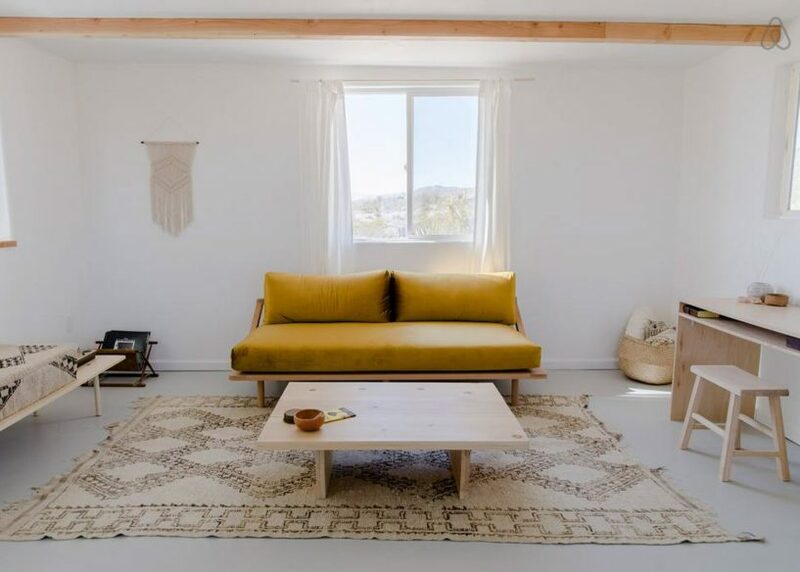 I was completely overwhelmed by the choice during our California road trip and spent ages whittling down a shortlist. 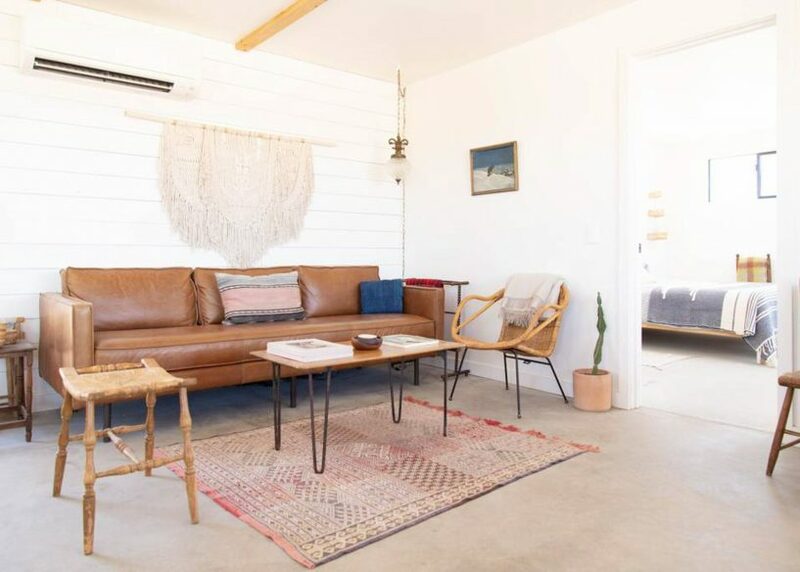 This is the selection I narrowed it down to: my pick of the most stylish Joshua Tree AirBnB cabins. 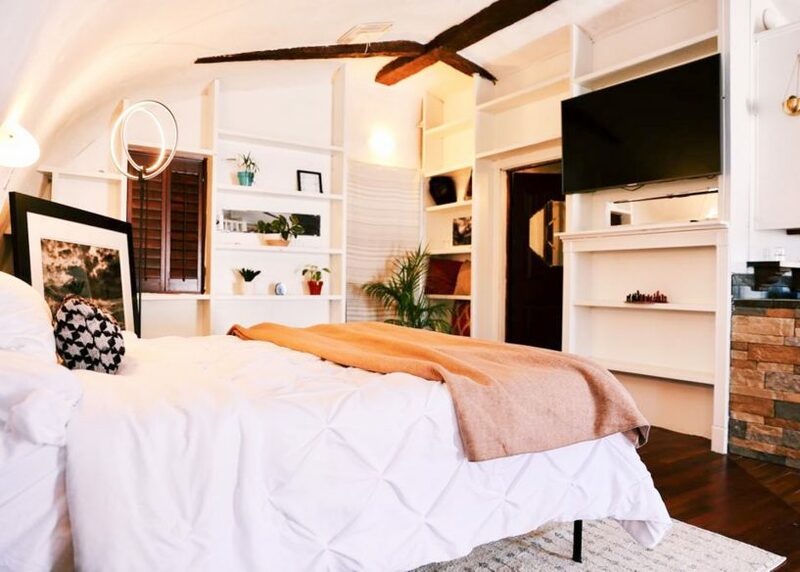 I chose them based on the style plus the reviews, so although I only stayed in one of them, based on the reviews, I think they’re all winners. 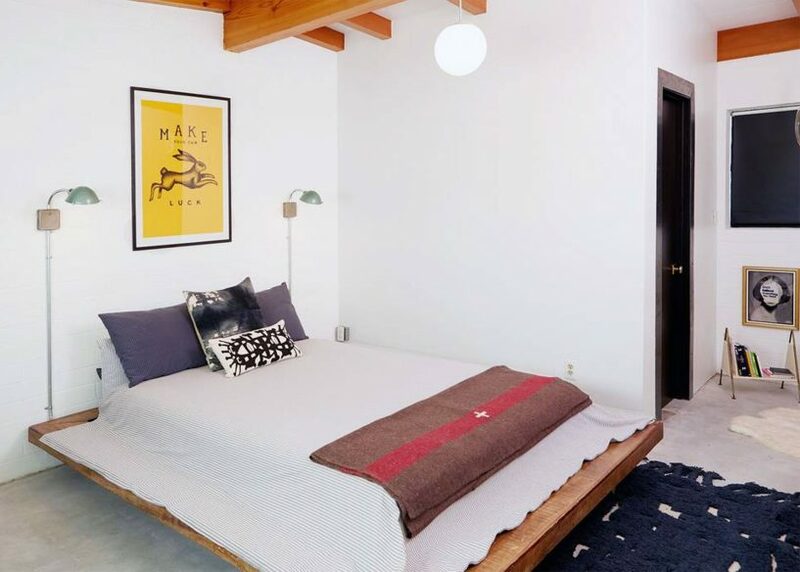 You can use this link to get $25 off your first booking with AirBnB. 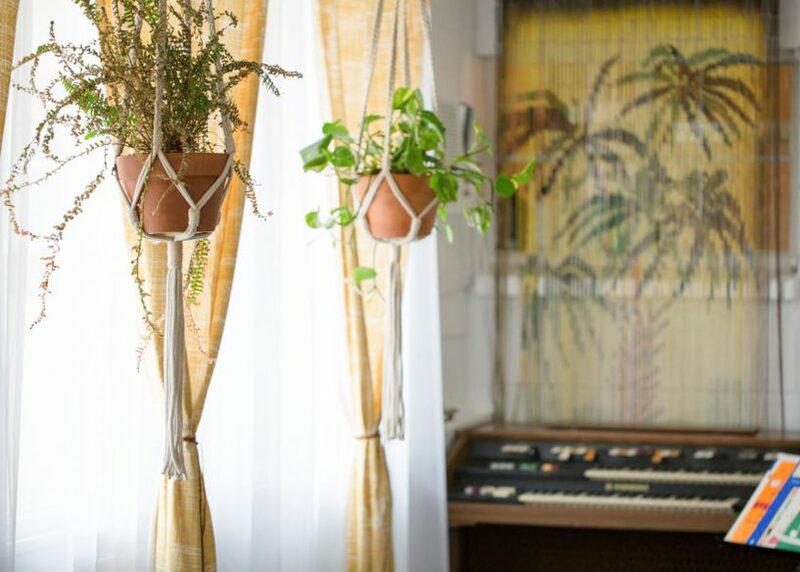 All photos are from the AirBnB listings courtesy of the owners/AirBnB. 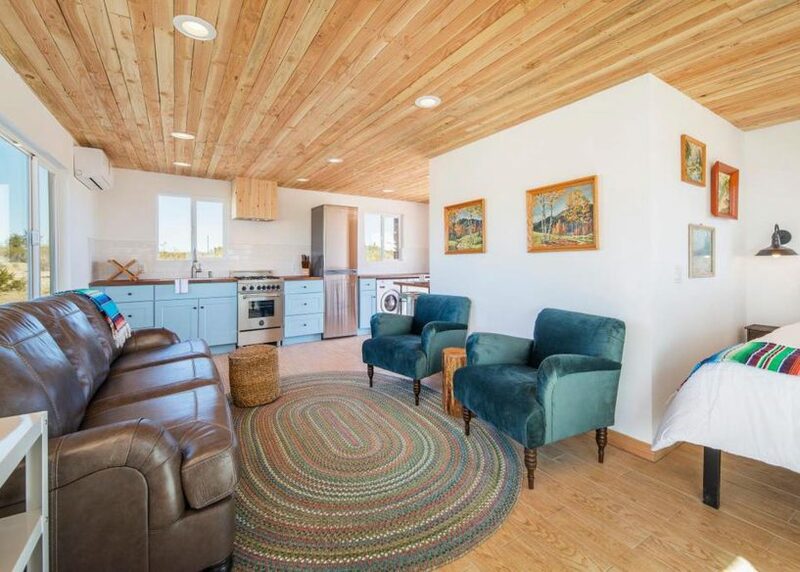 This is the cabin we finally chose. 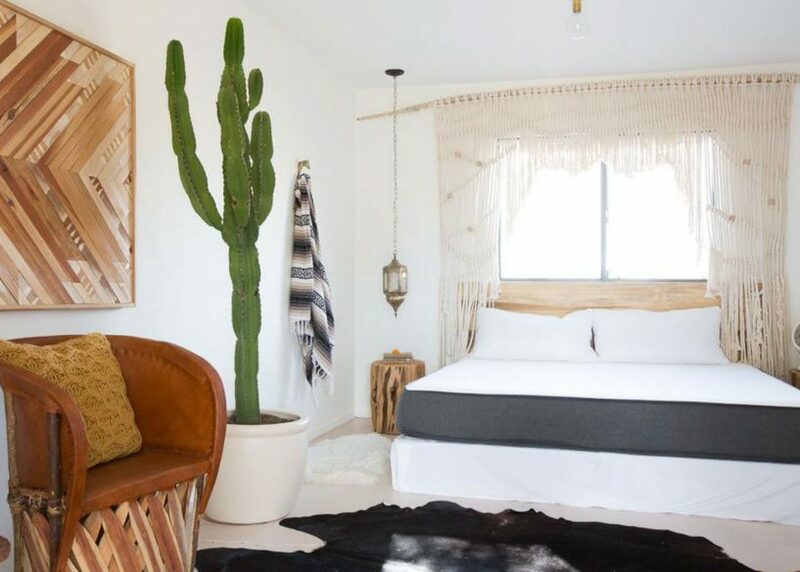 It epitomises the desert chic vibe that characterises so many of the Joshua Tree cabins, but it does it particularly well. 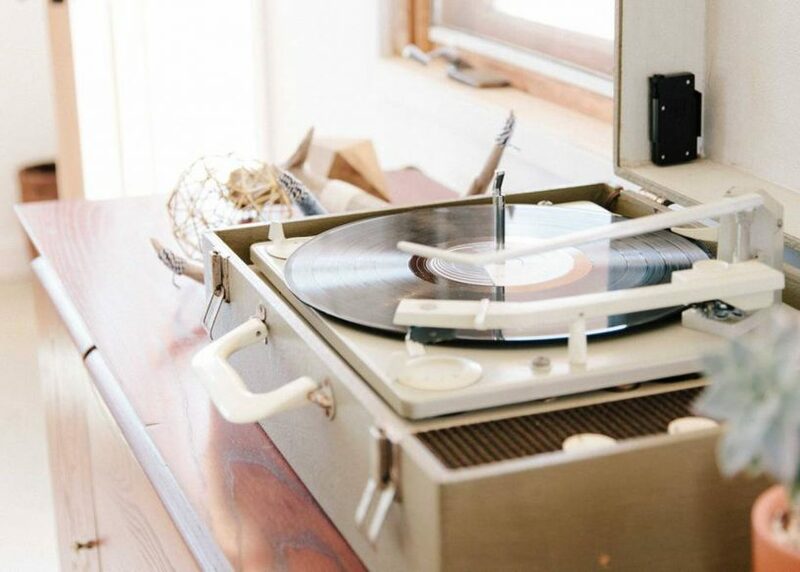 It includes thoughtful details like a hand-drawn guide to the cabin and local area, a telescope for stargazing, and a record player with a well curated vinyl collection – plus all the interiors are perfectly styled. 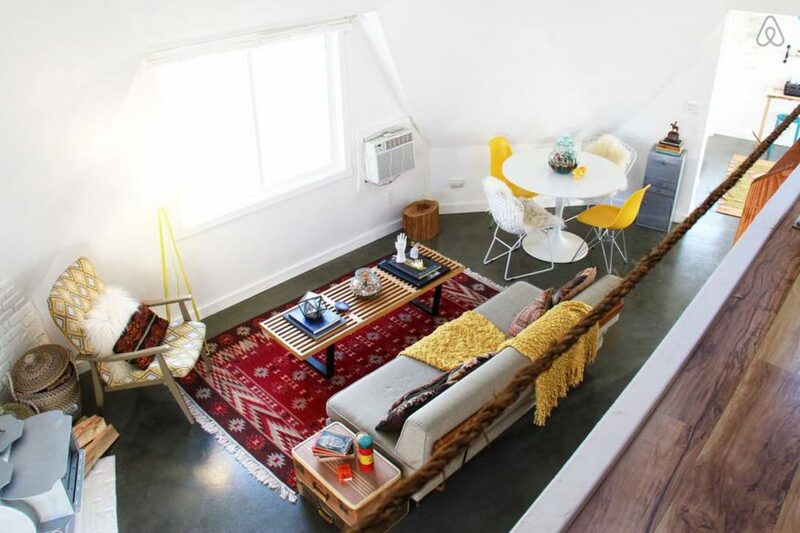 It’s a big place with a separate double bedroom, plus a sofa bed if there are four of you. And the fully equipped kitchen and dining table makes it perfect for groups. There’s even a little bocce court in the yard. 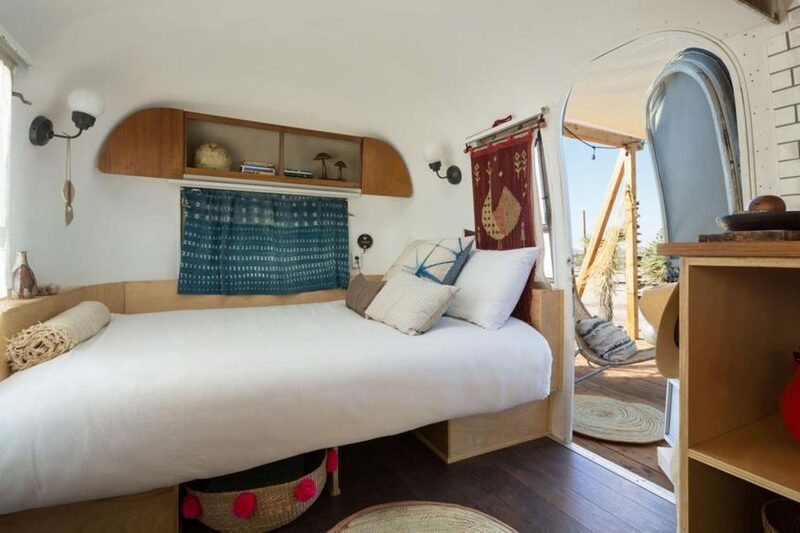 And there’s a neighbouring AirBnB – a converted bus – that can sleep two more. 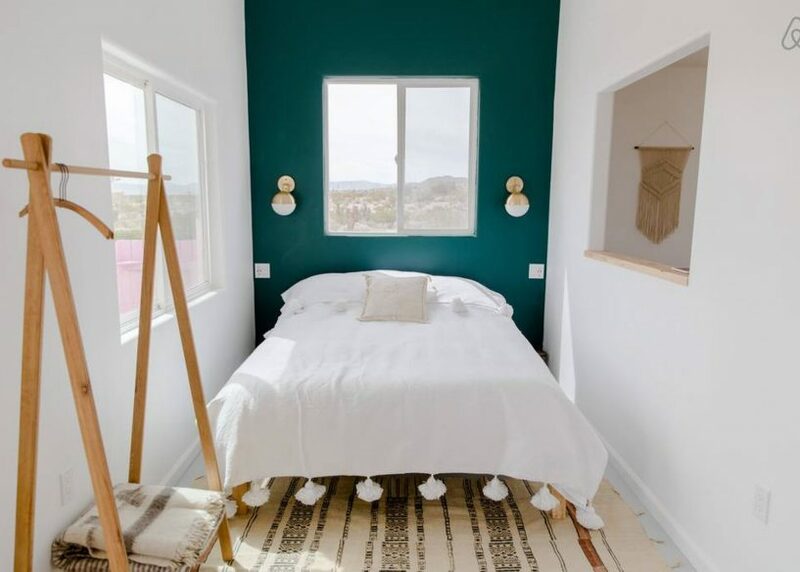 It’s about a five-minute drive from Joshua Tree town and another 15 minutes to the national park. 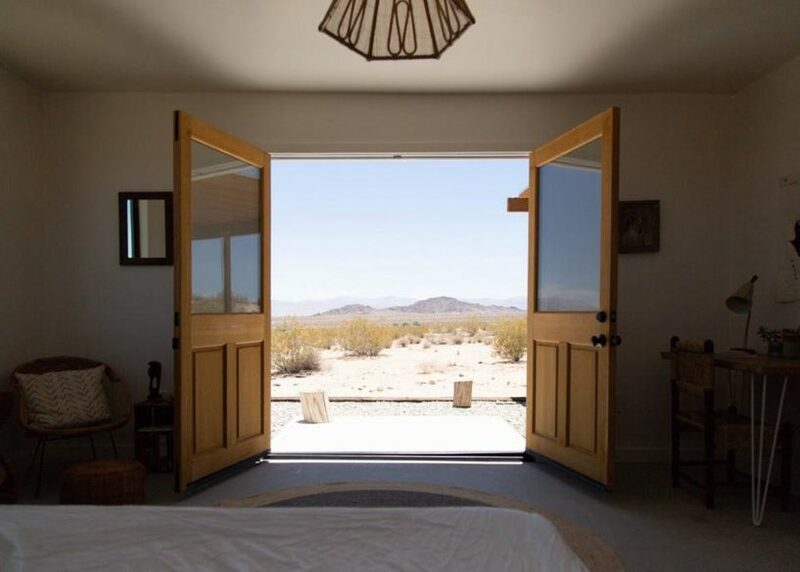 I can vouch that it’s a gorgeous place to stay in Joshua Tree. I was nearly swayed to choose this place based on the outdoor pink shower alone! 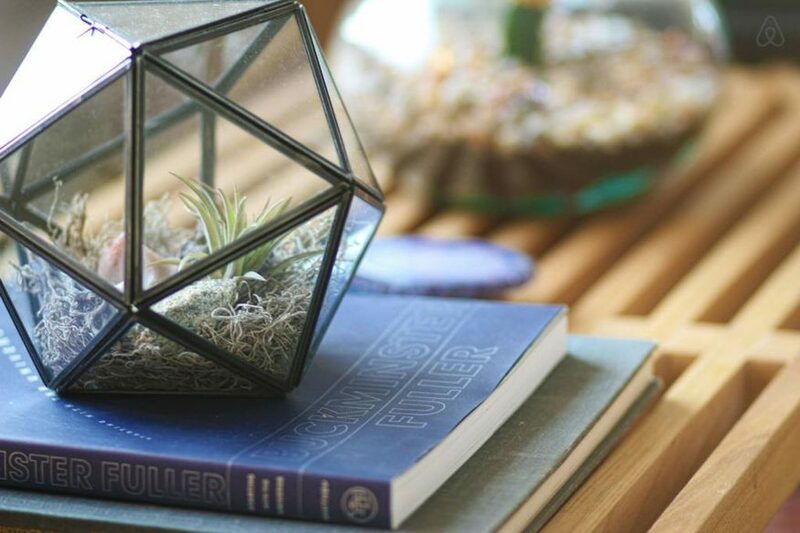 Just look at how cute it is! 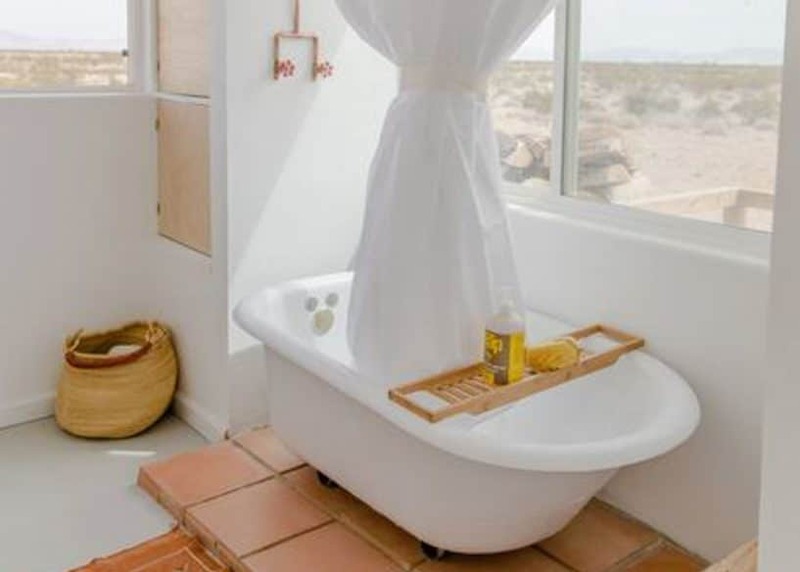 And I’m also a big fan of the clawfoot bath with a view of the surrounding desert. 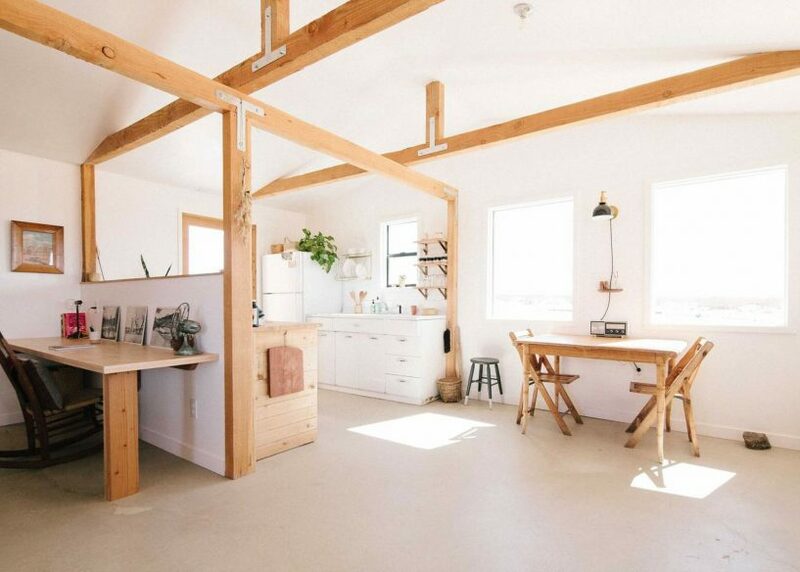 The off-grid homestead has a minimalist decor that creates a calm, relaxing getaway. 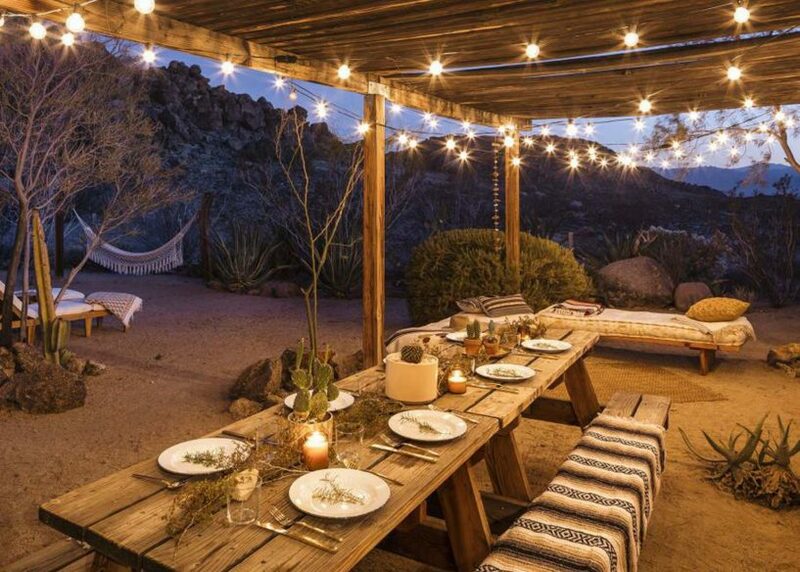 And the outdoor seating with fire pit would be a gorgeous place to hand out beneath the stars. 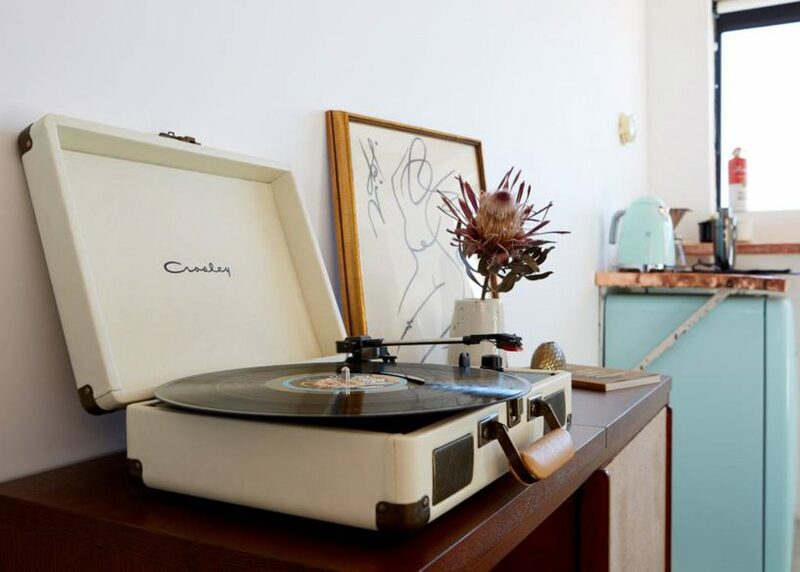 There’s even a Chemex – the hipster coffeemaker of choice. Note there is no A/C in the cabin. 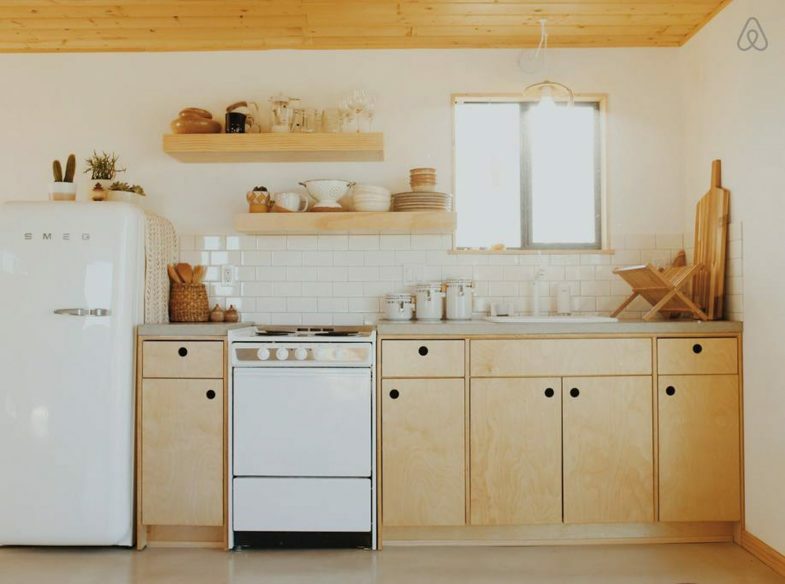 The Little Jo Cabin is one of a collection of four newly restored 1950s homestead cabins by a group called Yarfa. 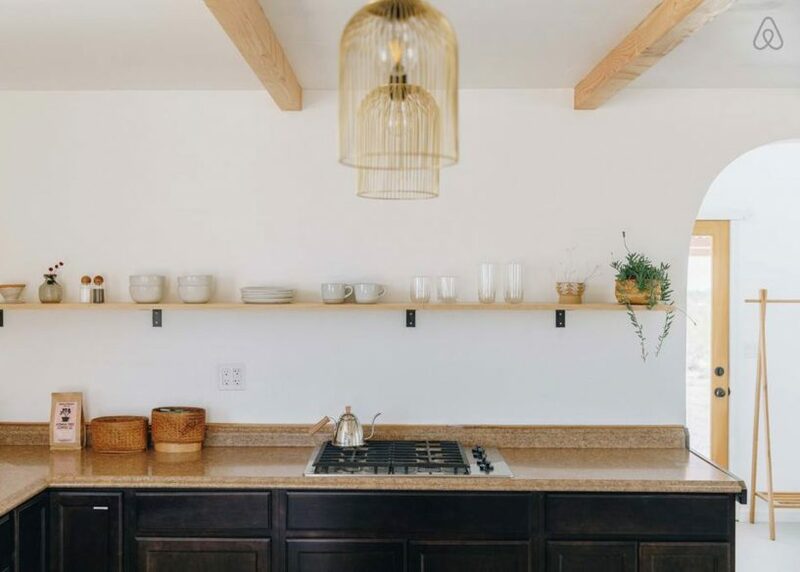 I’ve included the others on this list too as they’re all gorgeous, decorated with plenty of natural materials, woods and tones. 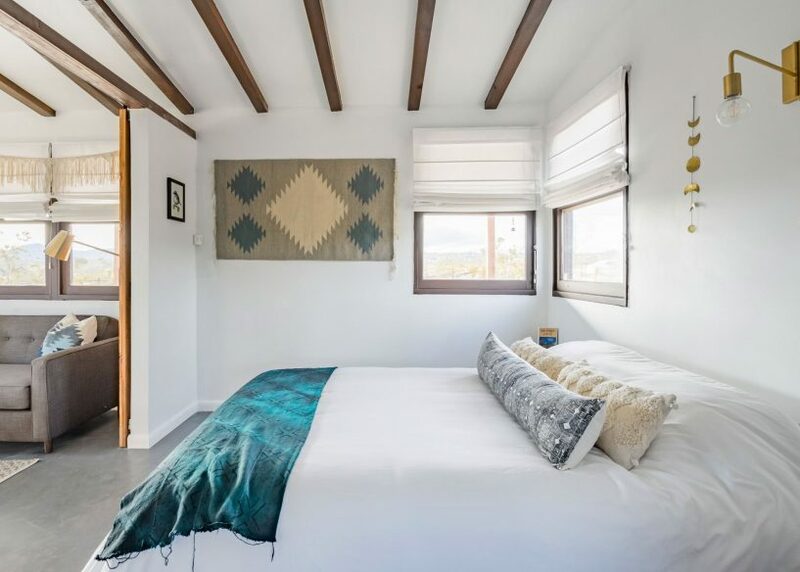 The Little Jo Cabin is made up of two parts including a little casita that houses the second bedroom (this is only unlocked if you book for more than two guests). 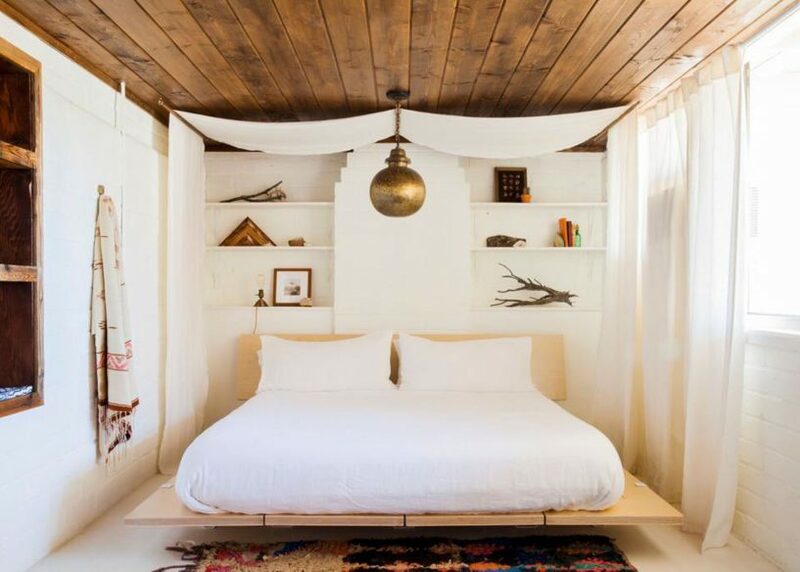 The Luna Cabin is by the same people who run Little Jo and as such has the same hipster-perfect desert decor of white walls, natural woods and bohemian fabric touches. 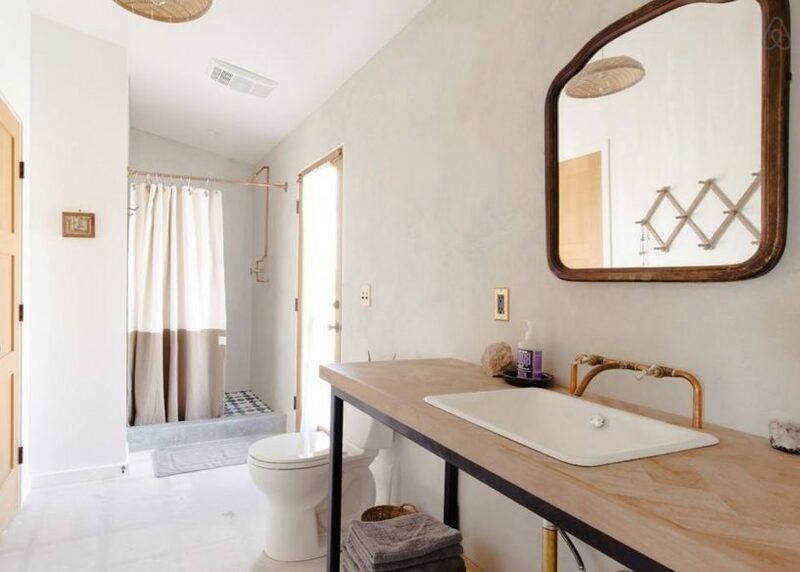 It’s all been carefully renovated and comes with lots of creature comforts including a brand new bathroom, kitchen ac/heat, a wood burning stove and outdoor shower. 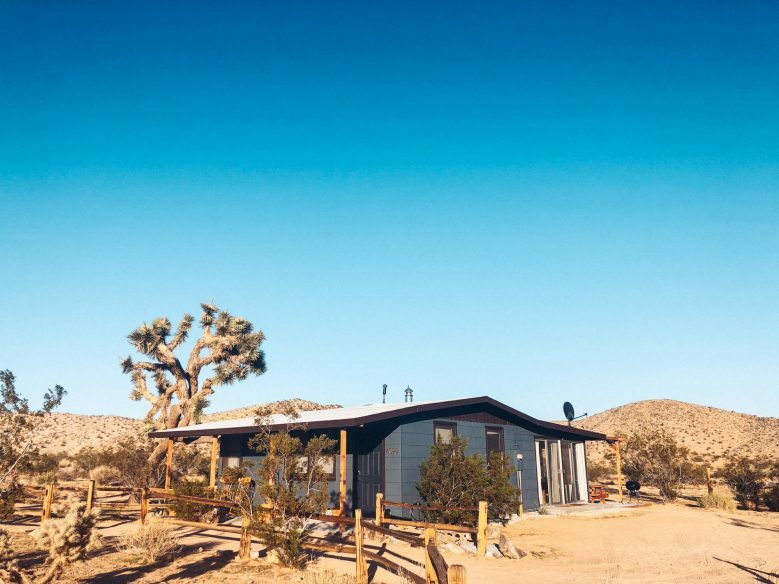 The town of Joshua Tree is about 15 minutes’ drive away. 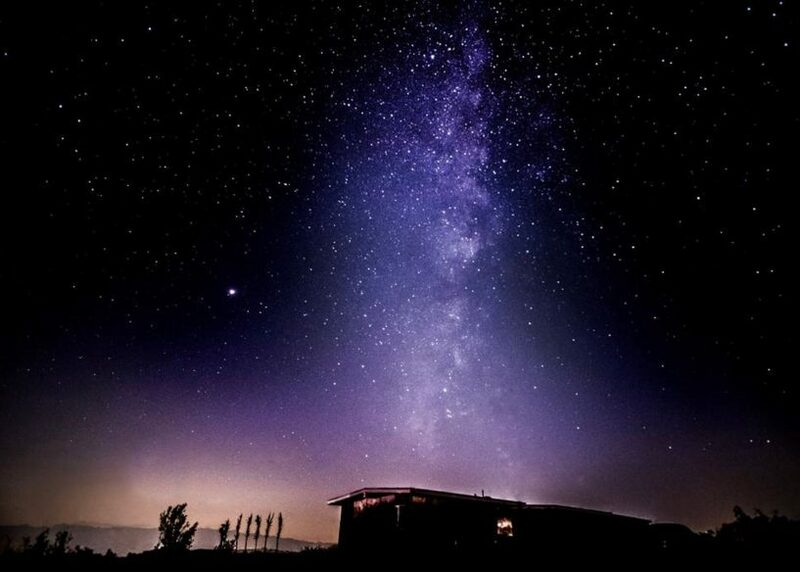 This gorgeous dome was created by a couple-team who are also the creativity behind two of the other cabins on this list (Cabin Cabin Cabin and The Shack Attack). 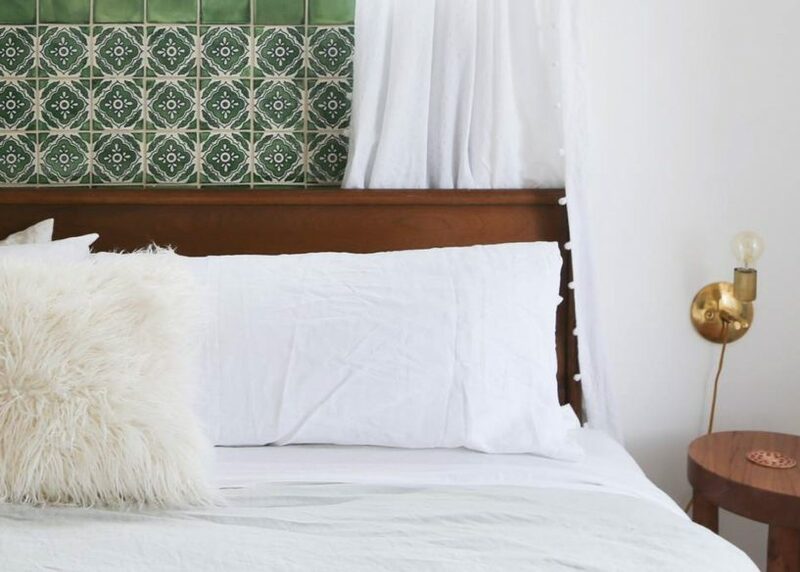 Secluded from neighbours, it’s offers a private escape designed in a modern-bohemian style. 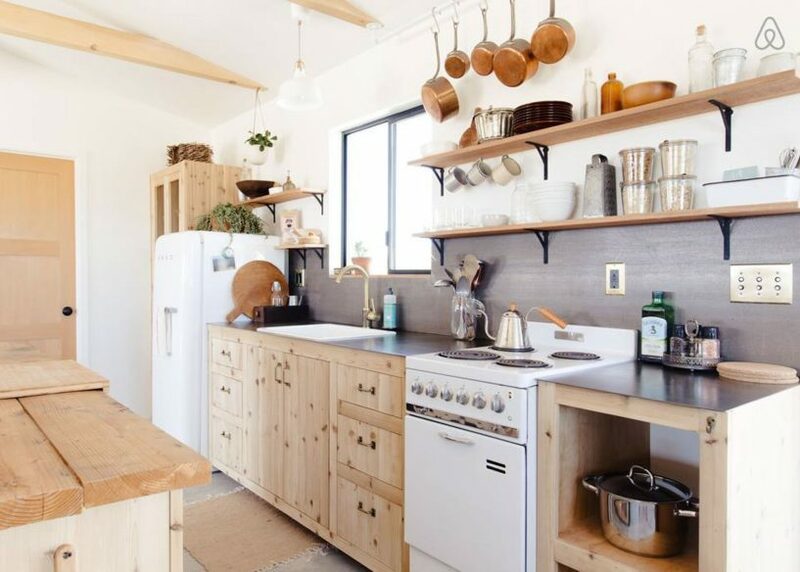 There’s a full kitchen, so you could easily sped your whole time relaxing and spending your evenings below the stars. 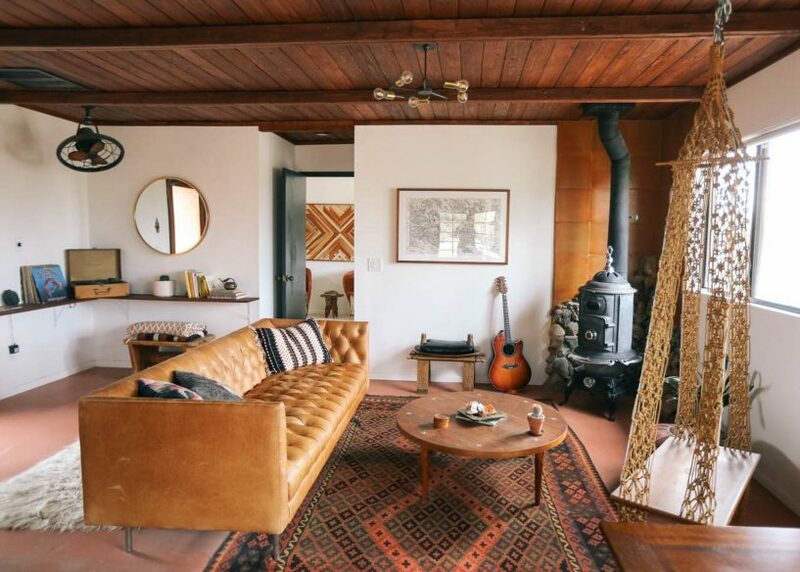 It’s heated with a natural wood burning stove and there’s wi-fi if you need it. 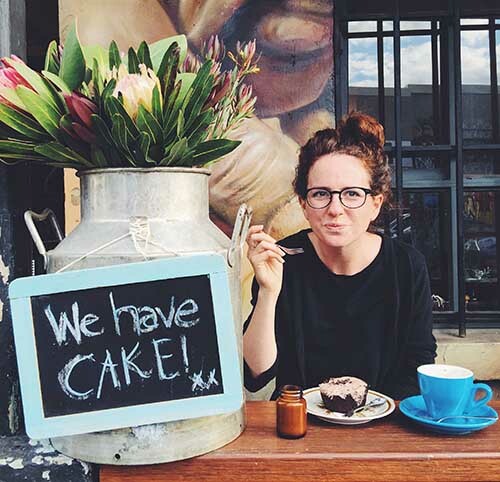 And for the ultimate hipster add-on, you can pre-order juices from juicing guru, Angela of Juice in the Desert. 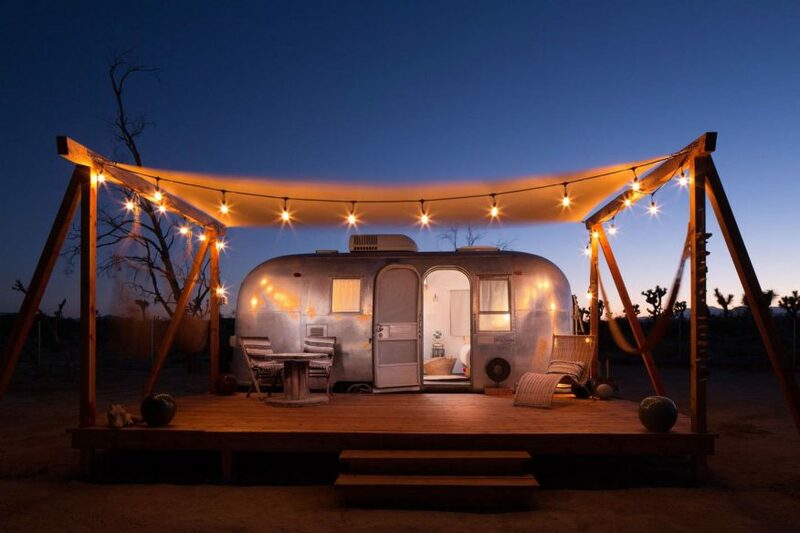 Joshua Tree Acres is a collection of four impeccably designed vintage airstreams that share a communal clubhouse. 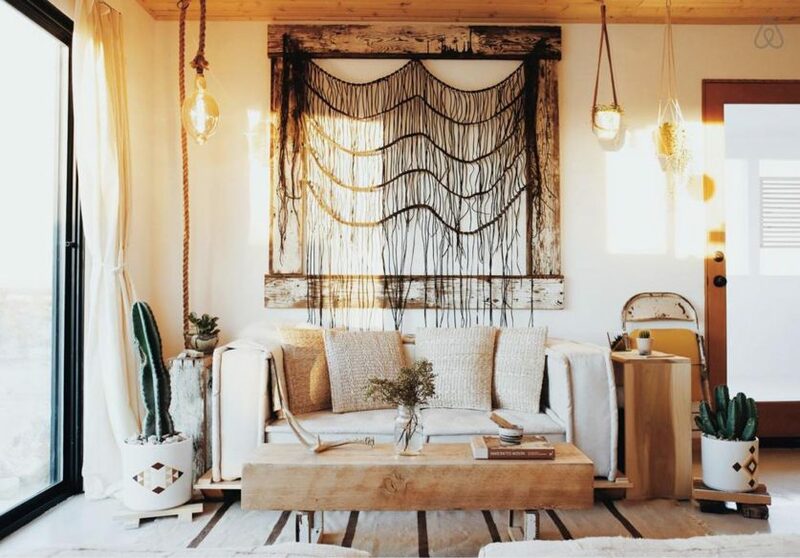 They’re decorated in the quintessential Joshua Tree style with lots of natural wood, white walls, succulents and boho fabrics. And the communal clubhouse is equally beautiful, including a kitchen, lounge area and bathroom. 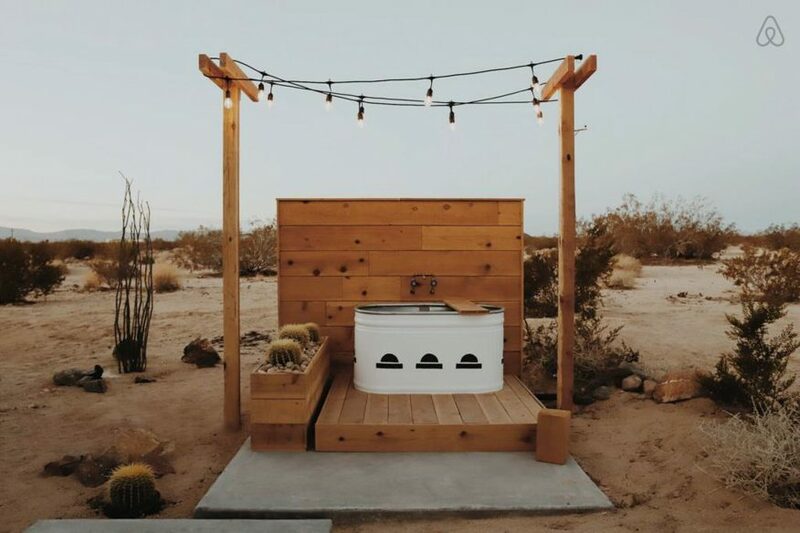 There is also a communal hot tub, cold plunge pool (seasonal), clawfoot bathtub, outdoor shower, outdoor kitchen, dining area and fireplace. 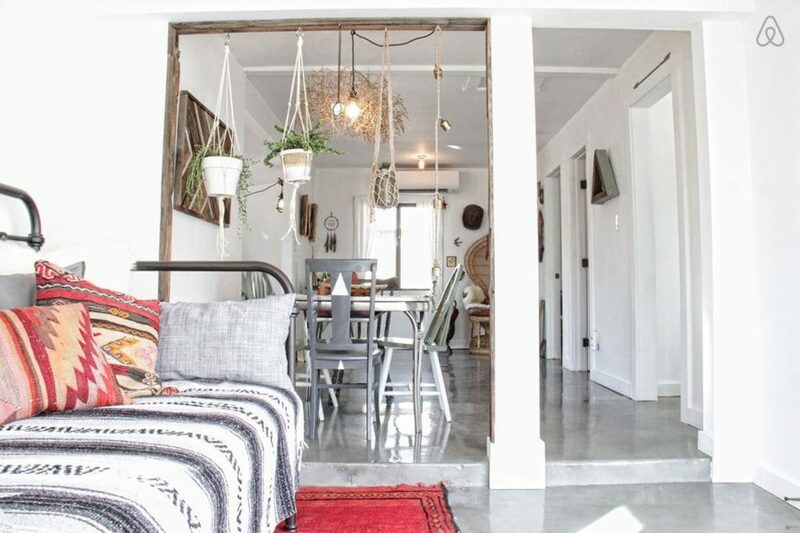 Just have a look at their Instagram to see how picture perfect the whole place is. 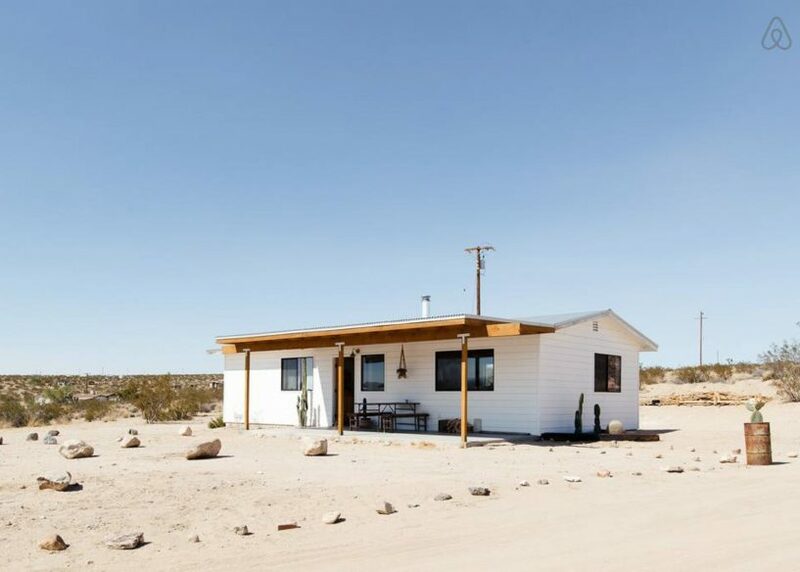 With the same impeccable style of sister property, the Dome in the Desert, Cabin Cabin Cabin was created to celebrate the original homestead cabins of Joshua Tree. 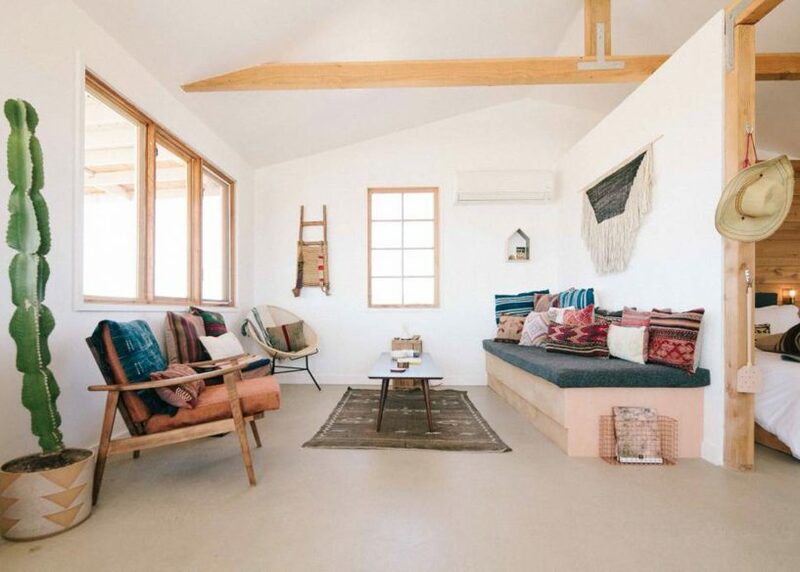 There are lots of cosy nooks and the cabin has heating and a/c to keep you comfy at any time of year. 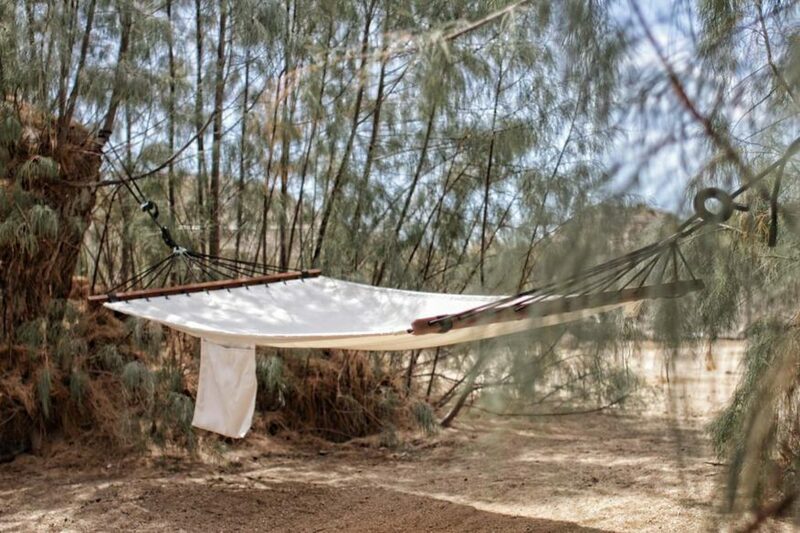 The icing on the cake is the outdoor living space, complete with an outdoor clawfoot bathtub, plus a hammock hung between two Tamarisk trees. 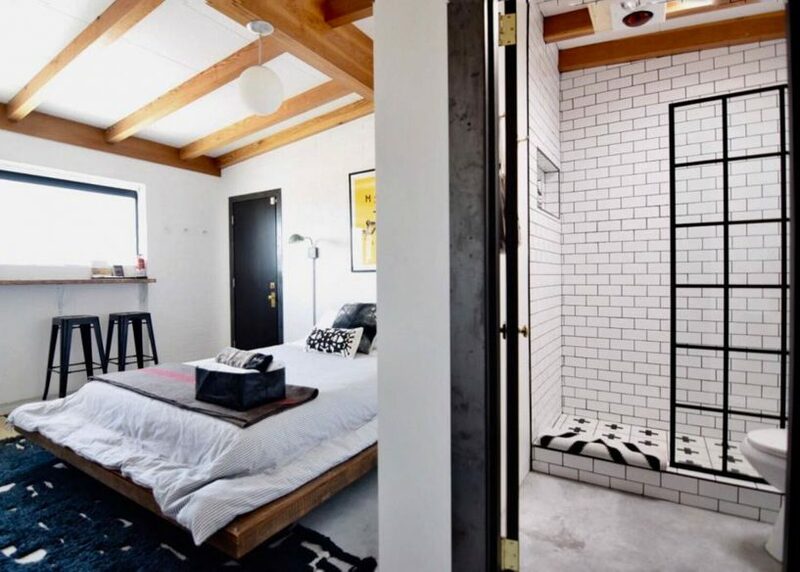 And even if you prefer to stay inside, the skylight above the shower will make you feel liked you’re right outside. 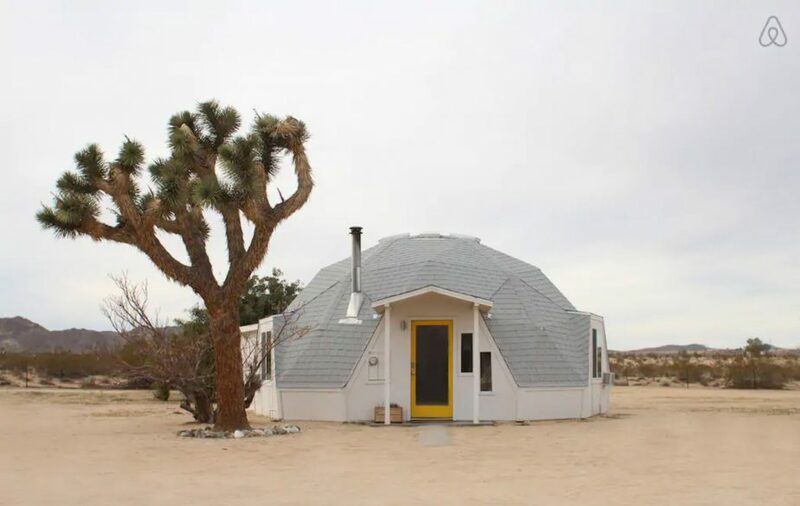 Like the dome, you have the services of Angela at Juice in the Desert. 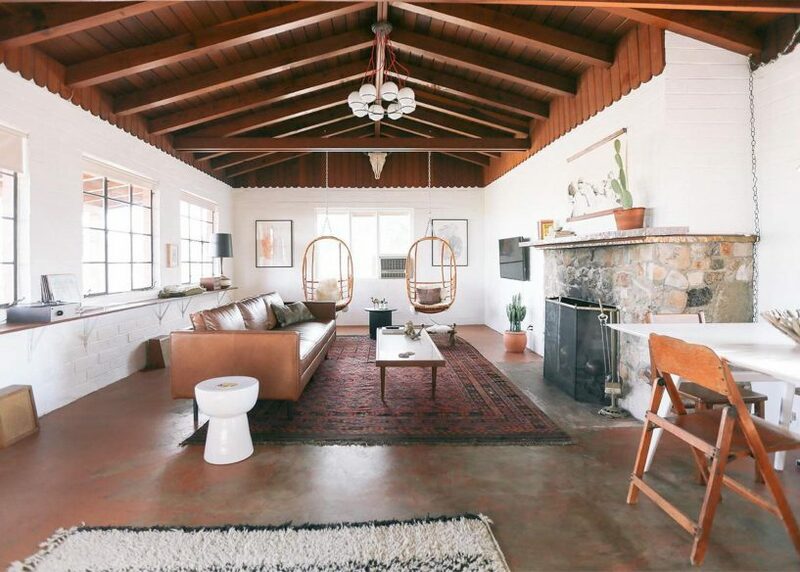 It’s within walking distance of Joshua Tree town. 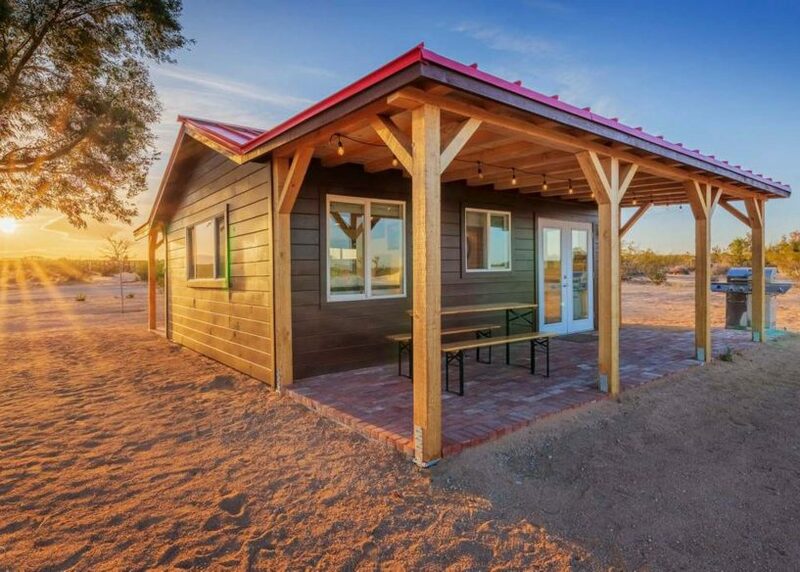 The Shack Attack is the final member of the Dome in the Desert and Cabin Cabin Cabin family. 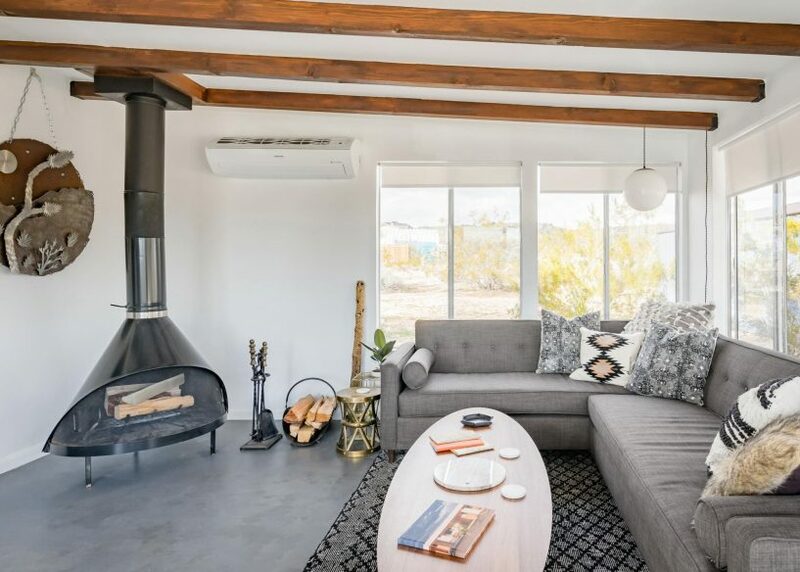 It’s located up in a secluded corner of North Joshua Tree and was completely rebuilt by the owners. 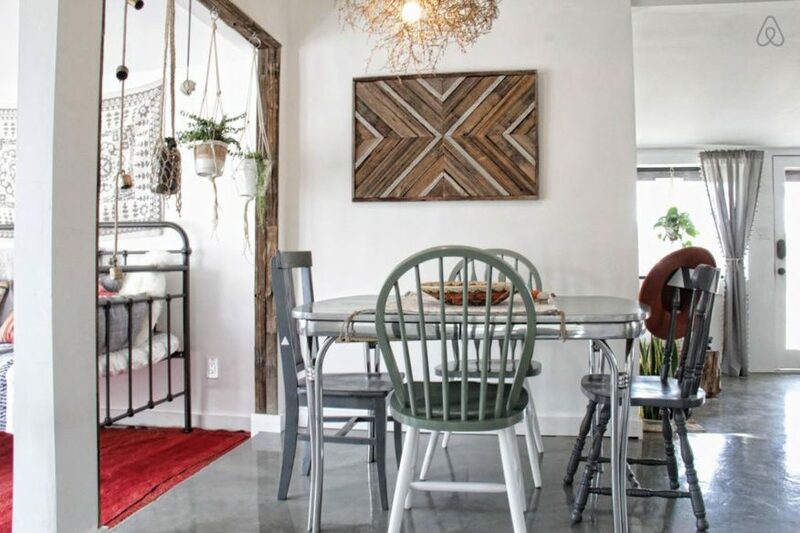 It packs a lot into 500 square feet, including a fully equipped kitchen, studio-style living space, king-size bed and beautiful bathroom with a huge walk-in shower. 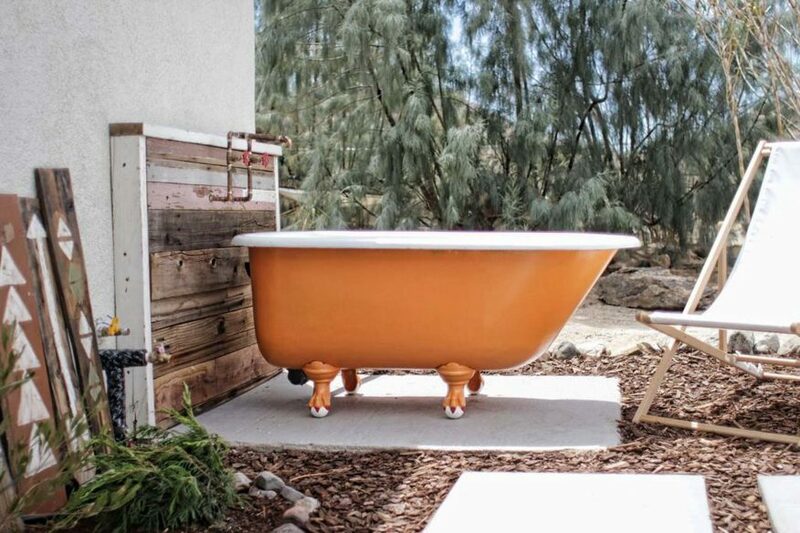 And like Cabin Cabin Cabin, there’s a beautiful outdoor tub with hot and cold water. 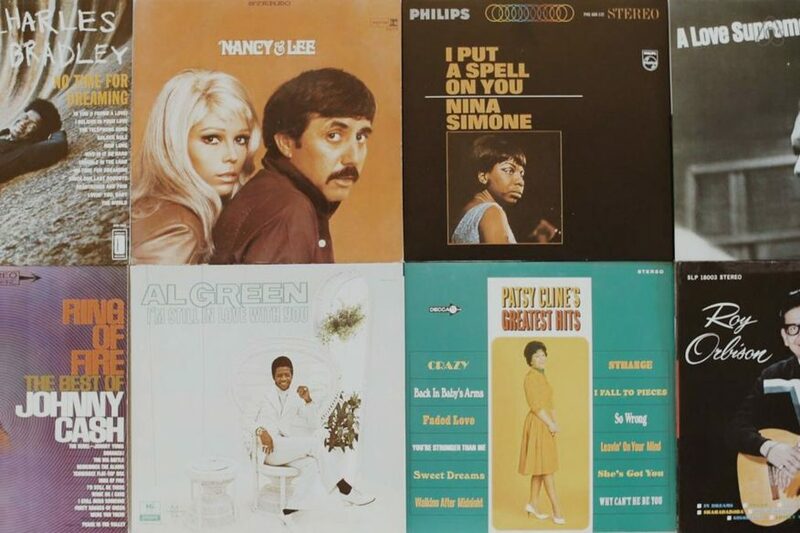 Also enjoy that quintessential desert-cabin amenity: a carefully curated selection of vinyl, including the likes of Nina Simone and Jon Coltrane. 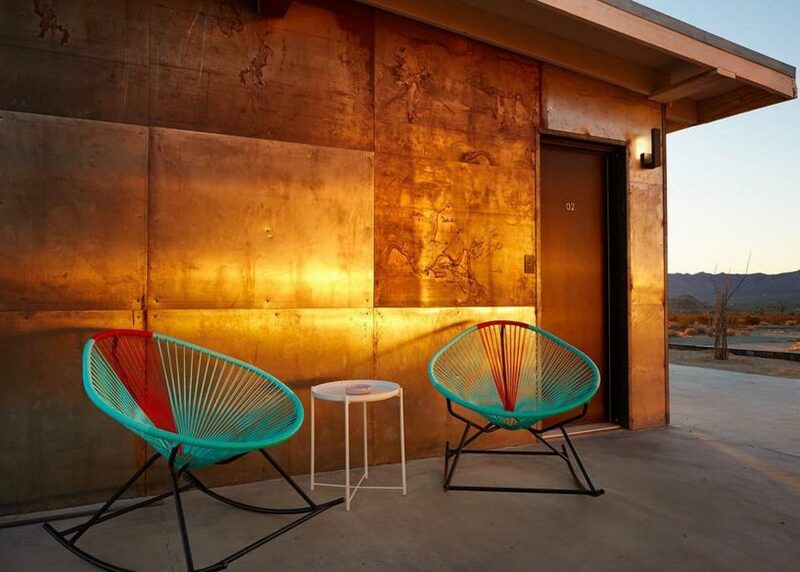 This metal-clad cabin looks particularly stunning in the sunlight when it reflects a golden glow. 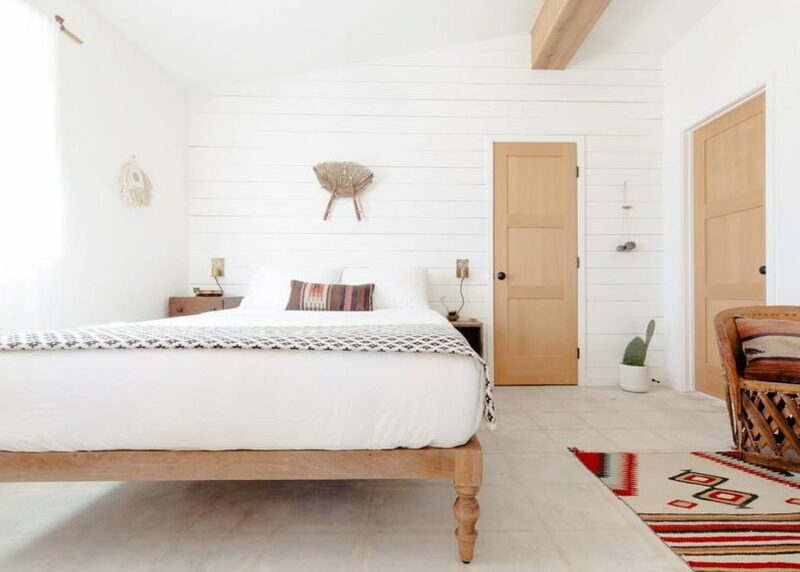 The interiors of the studio are stunning, incluidnf stained concrete floors, a reclaimed wood platform bed, a copper barter and lots of vintage touches. 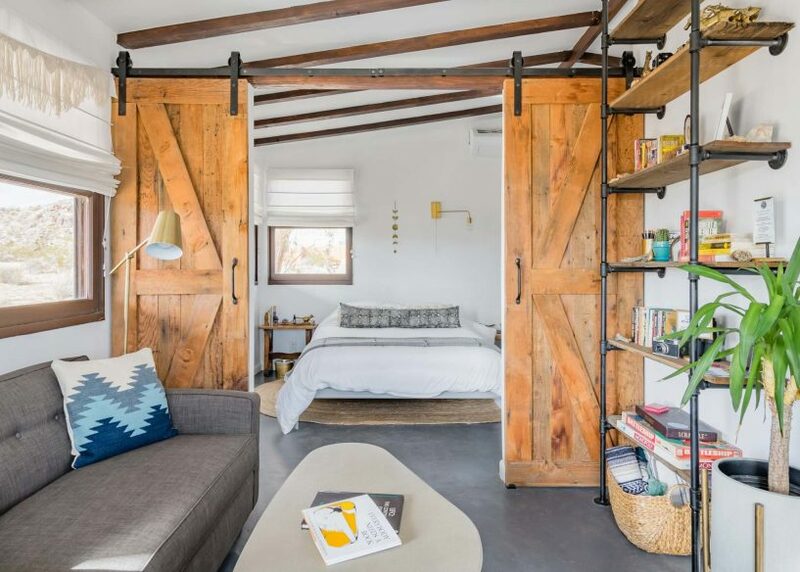 It’s within walking distance of Noah Purifoy’s outdoor art museum and installations from the Desert X exhibition. 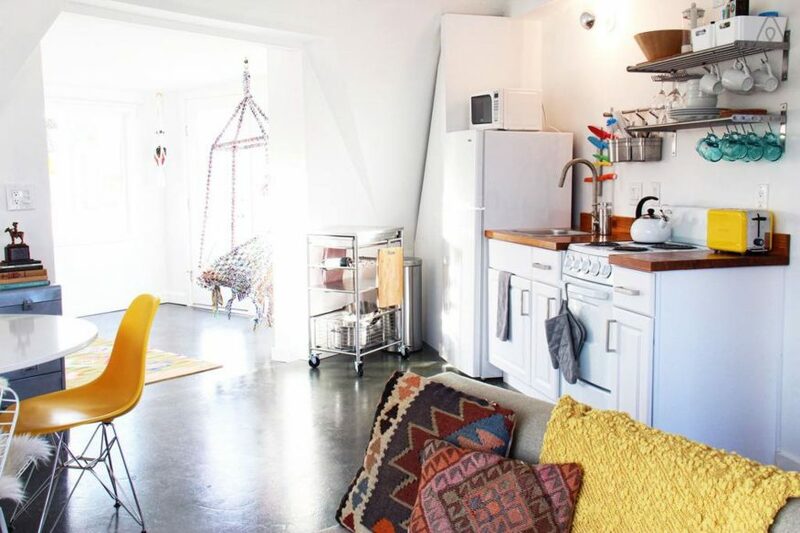 There is no kitchen, but a coffee machine and waffle maker is provided. 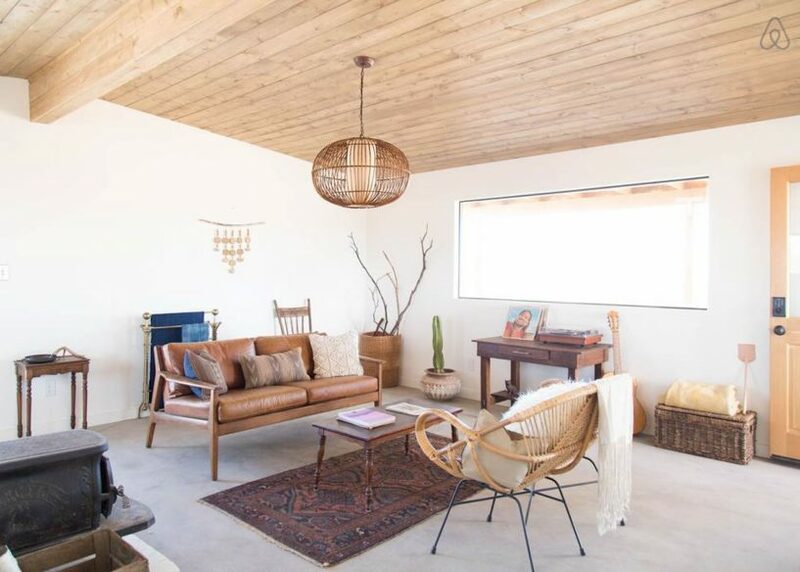 The Joshua Tree House was designed by a husband and wife team who have also authored a gorgeous coffee-table book, At Home in Joshua Tree: A Field Guide to Desert Living. 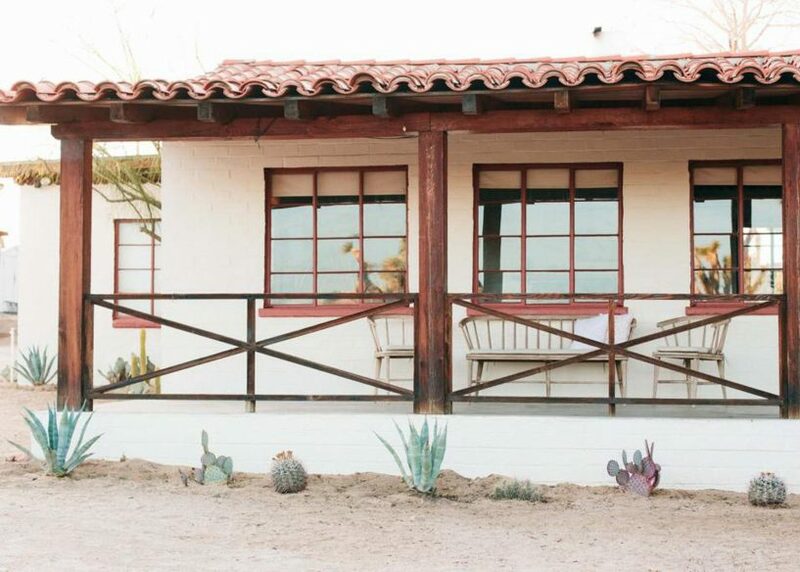 They have transformed the hacienda into a stylish, peaceful retreat that they love so much, they made it their home. 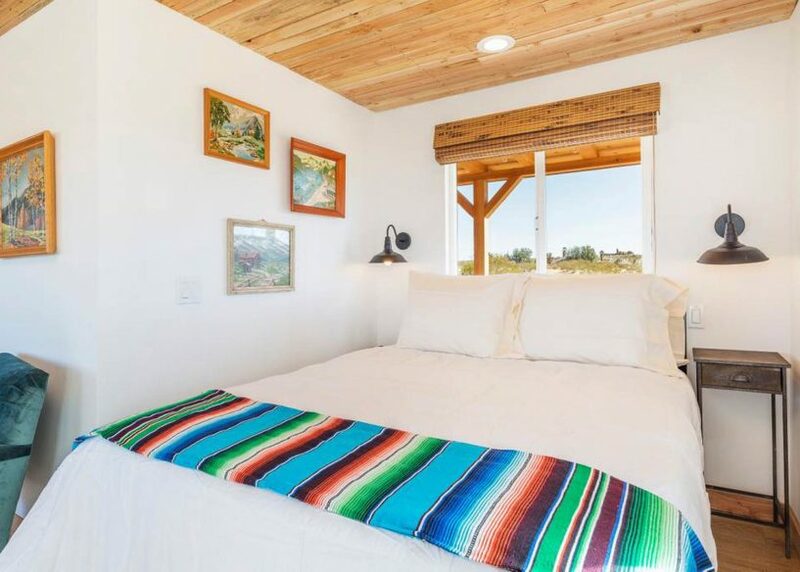 They still rent it out on AirBnB as well as a second property, the Casita. 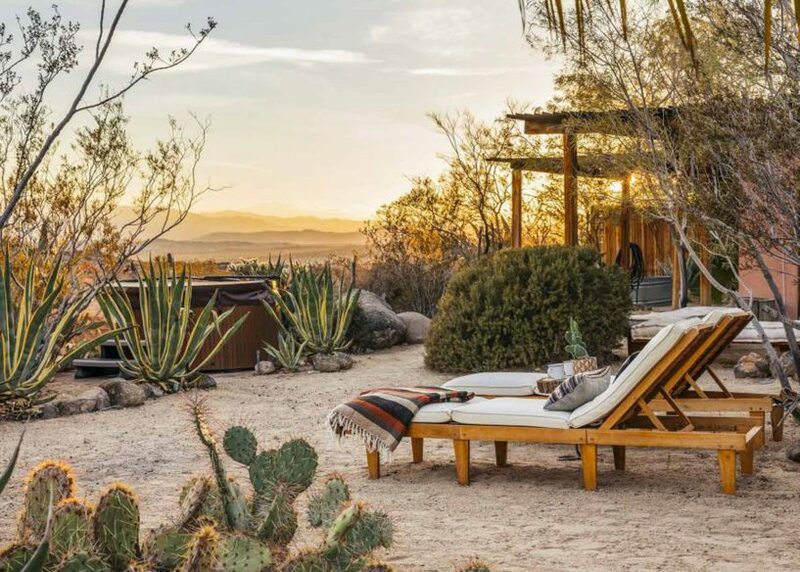 There are over 100 joshua trees on the property, so you’ll be surrounded by the famously otherworldly landscape. 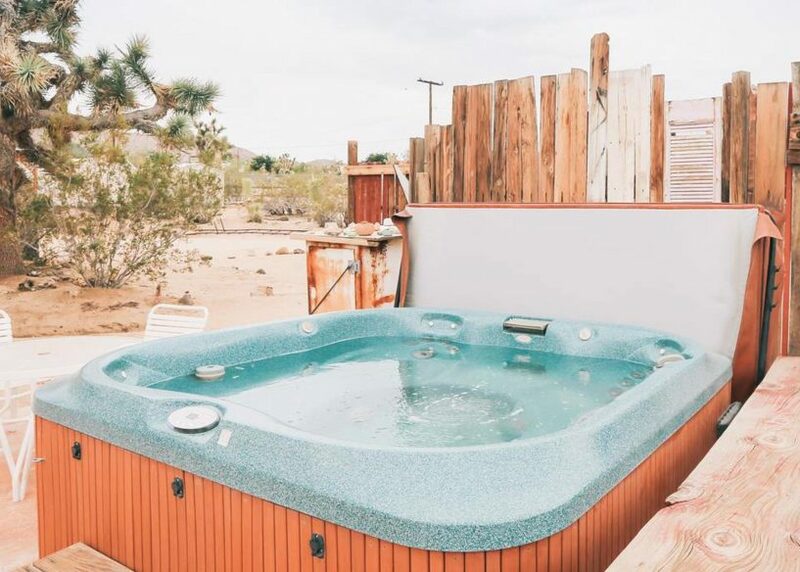 The emphasis is on relaxation and the home includes an outdoor hot tub, plus a tank pool in the summer months. 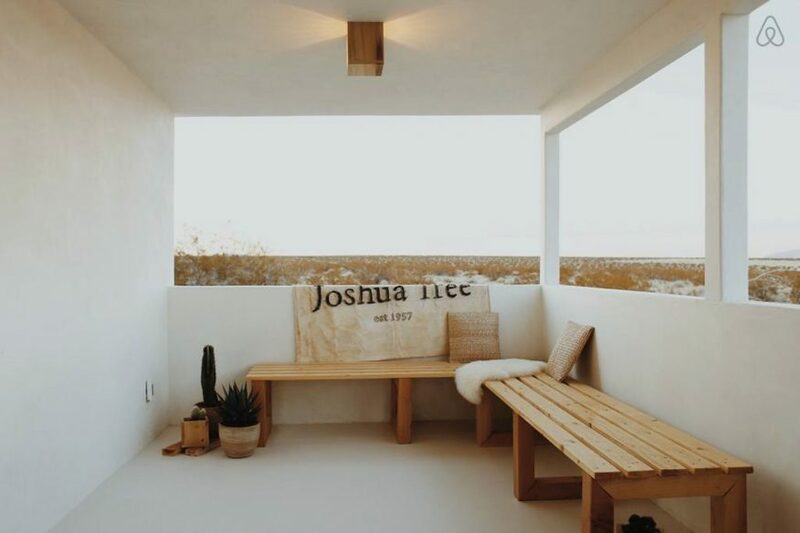 The Joshua Tree House is a 10 minute walk from Joshua Tree town, and just 10 minutes’ drive from the west entrance to Joshua Tree National Park. 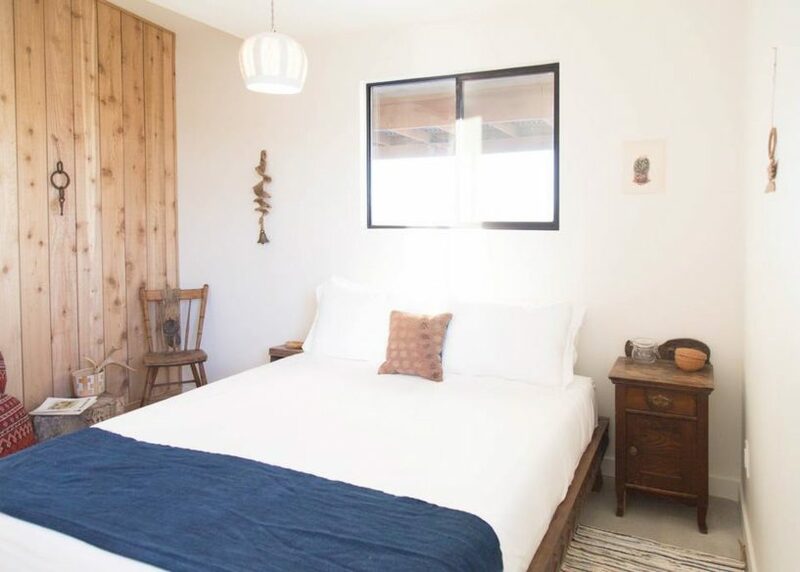 The Casita is the sister property of The Joshua Tree House, designed and run by the same husband and wife team. 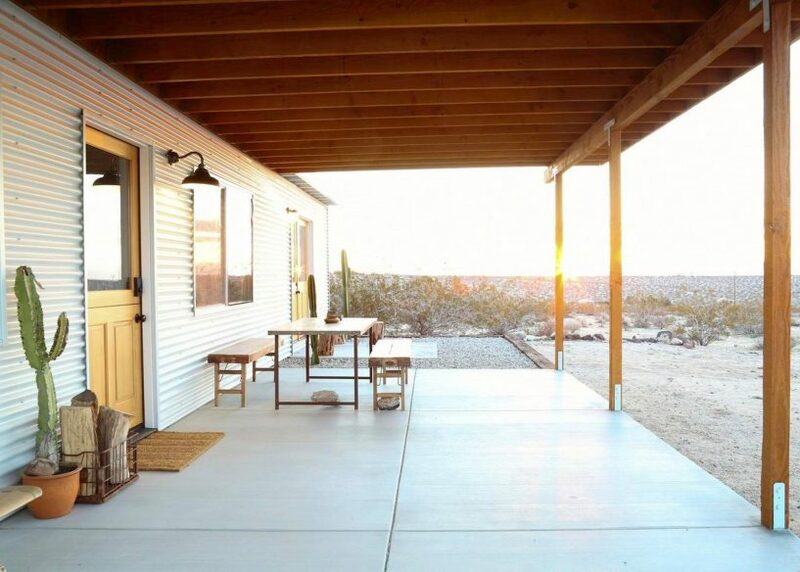 It’s more remote than The Joshua Tree House and is a 12-minute drive from Joshua Tree town. 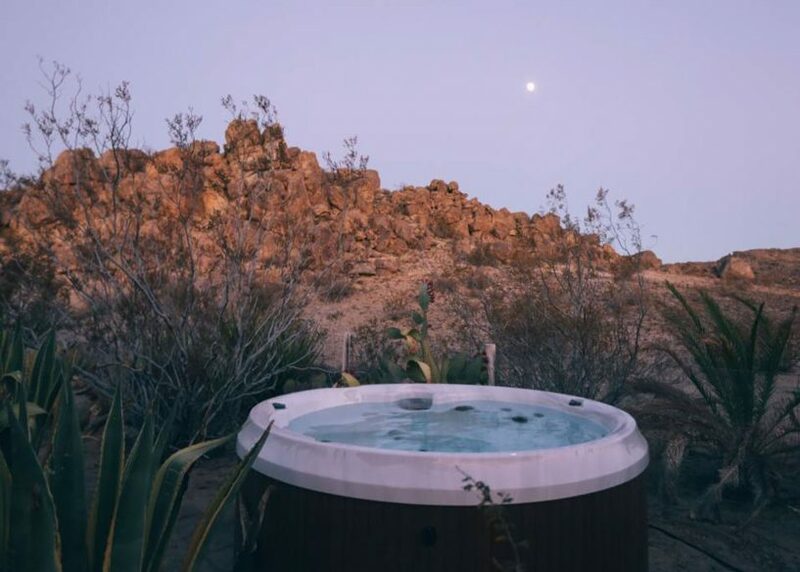 It has the same dreamy desert decor and also comes with a hot tub and beautifully appointed outdoor area that would be ideal for a dinner beneath the stars. 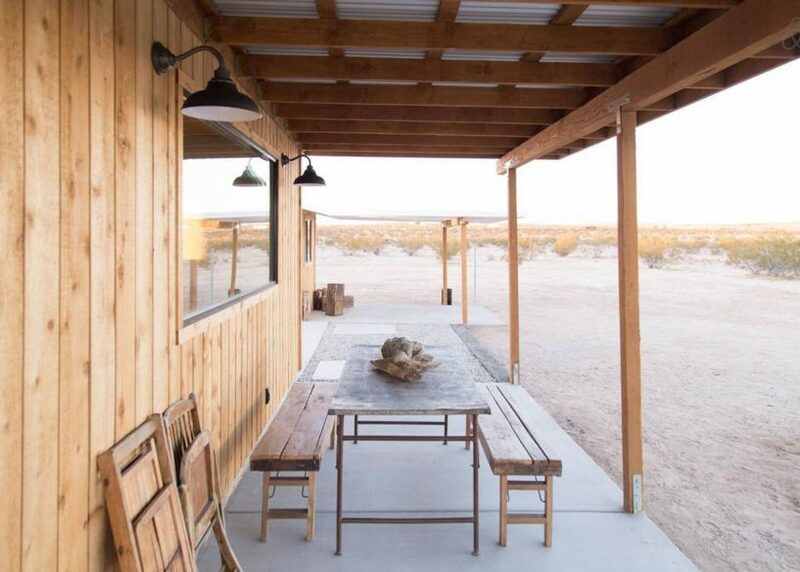 The Moon Camp is an eclectic desert retreat, including a main house, a guest house, a small gym, and an outdoor living space complete with a fire-pit grill and hammock. 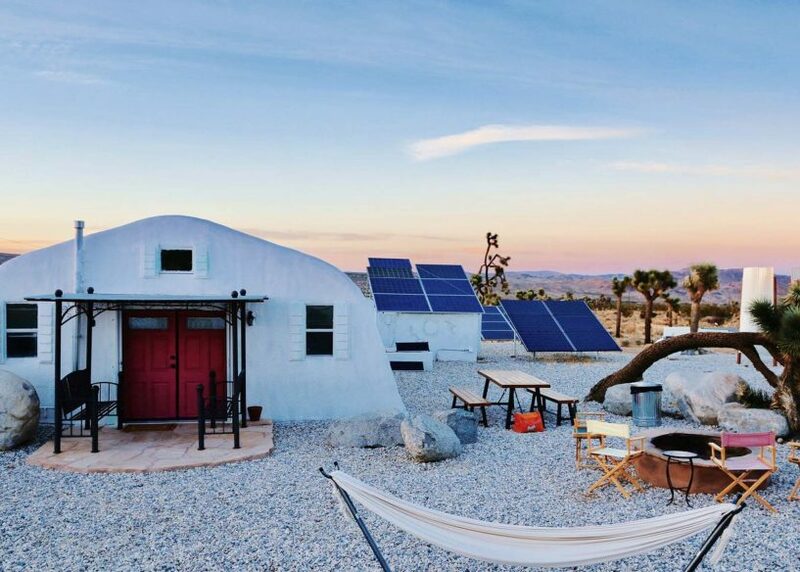 The off-grid retreat is powered by solar panels and the whole place is surrounded by Joshua trees. 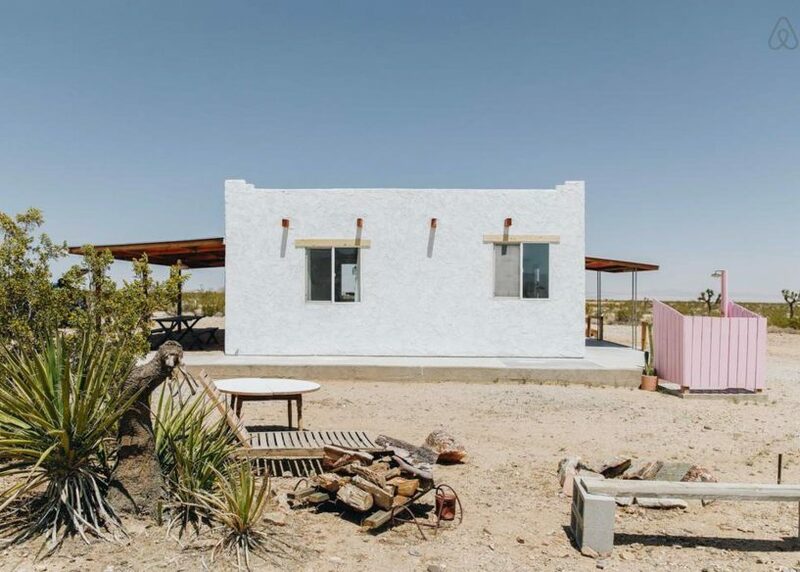 The white stone architecture is striking against the desert landscape. 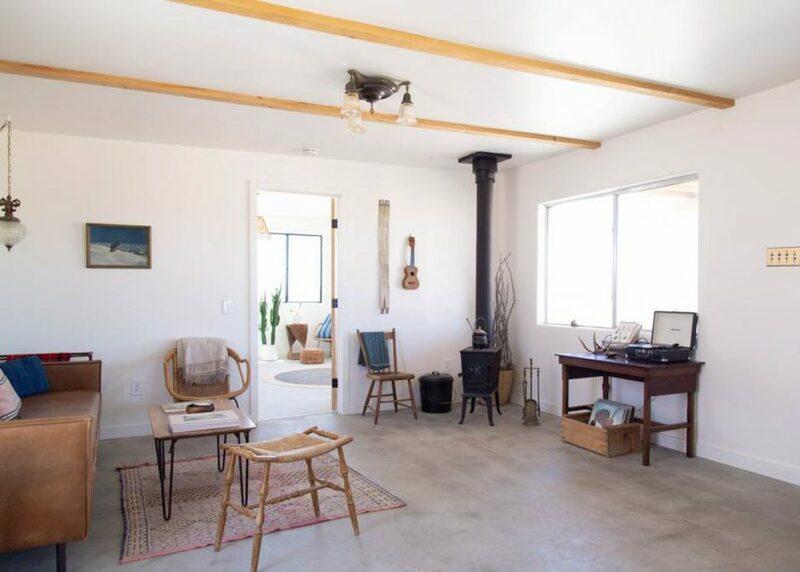 It’s just a seven-minute drive to Joshua Tree Town. 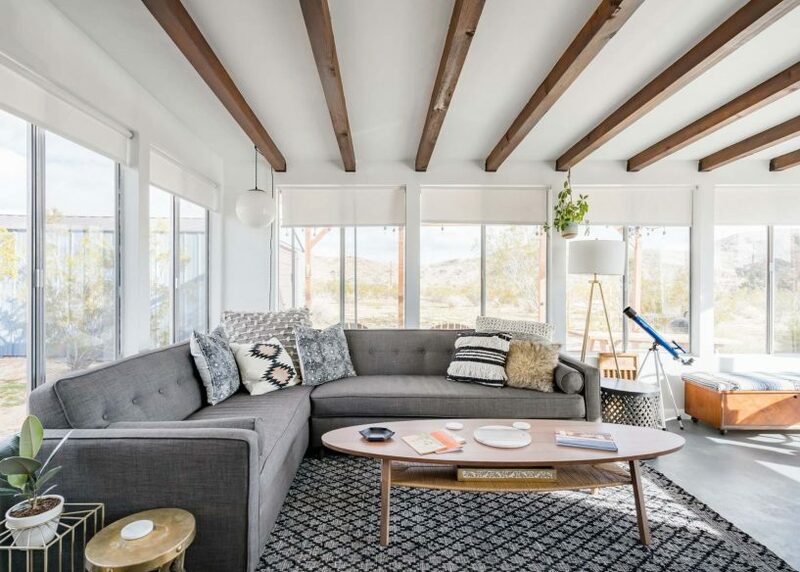 The Ridge at Joshua Tree stands out for its location atop a ridge with gorgeous views across the desert. 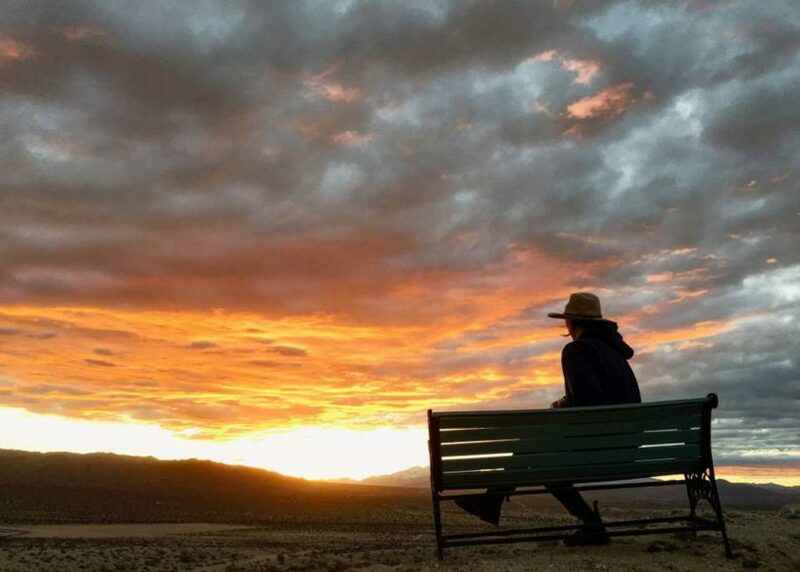 There’s a trail that circles five acres, including a viewpoint with a bench where you can gaze across the desert. 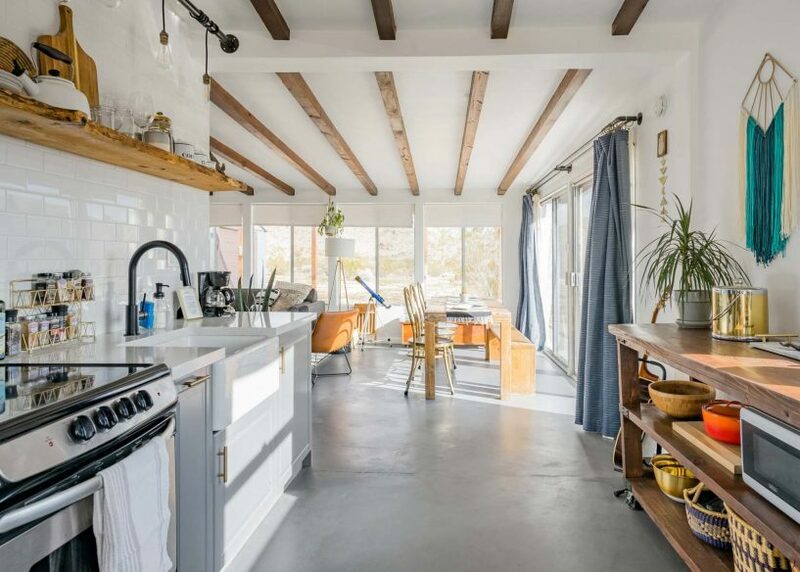 It includes a large kitchen, living room, sun room and enough space for six guests. 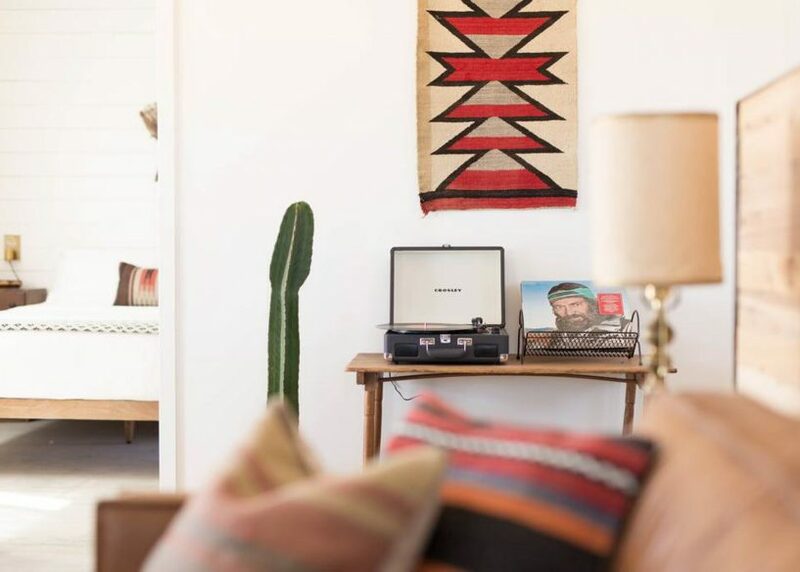 It has a rustic-vintage vibe and features some of the classic Joshua Tree AirBnB cabin stalwarts, such as a record player, guitar, boardgames and fireplace. 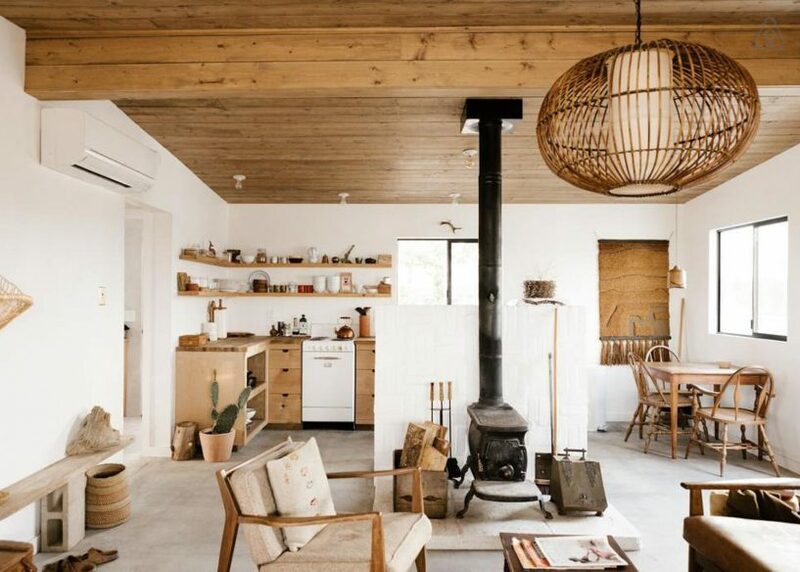 Another place by Yarfa, the Camper Cabin follows the same design aesthetic as their other properties and as such is a picture-perfect cabin that would look right at home in the pages of Kinfolk magazine. 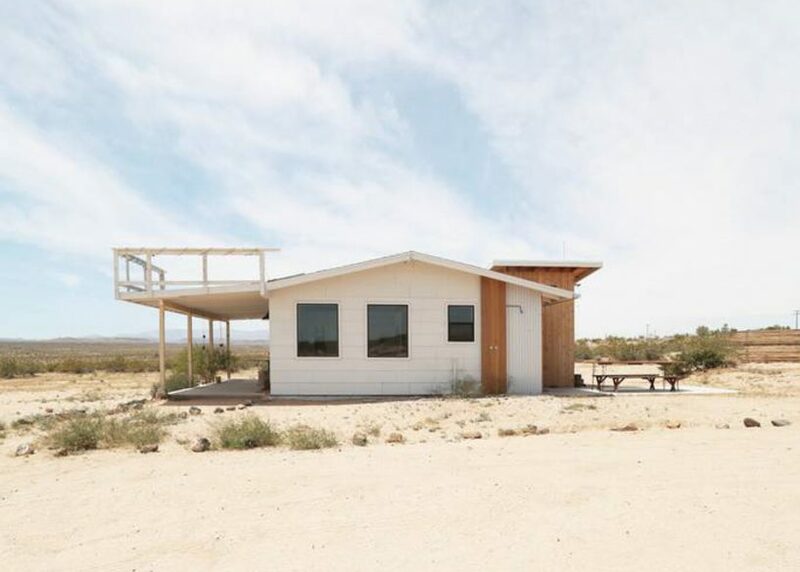 This one is a studio home in a remote location with fabulous unobstructed views across the desert. 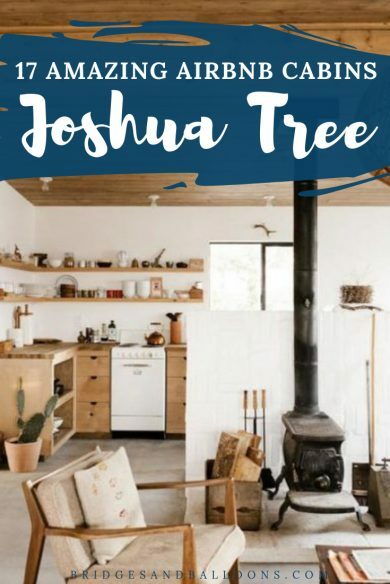 As with all the Yarfa homes, pour-over coffee from Joshua Tree Coffee Co and tea is provided. 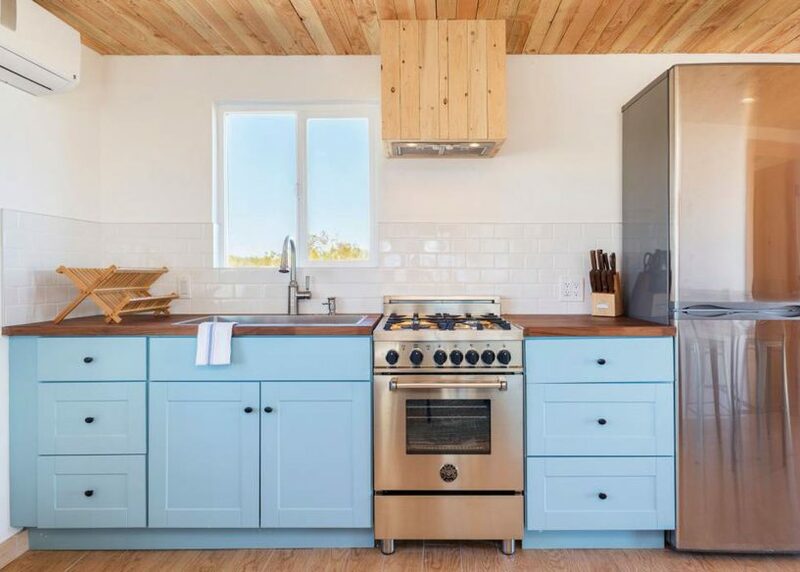 A final offering from Yarfa, the Wilder Cabin sleeps two people in a 1950s homestead that has been restored with plenty of love. 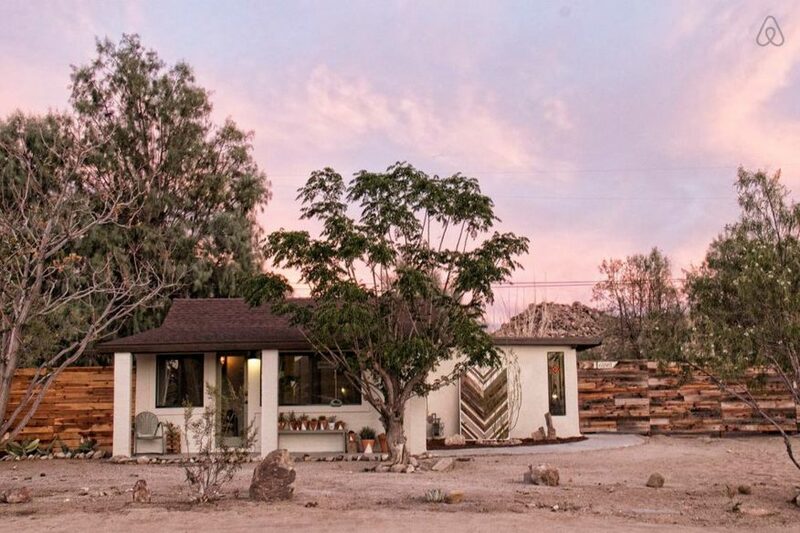 It’s set on 5 acres with panoramic views of the desert, perfect fir catching the sunset. 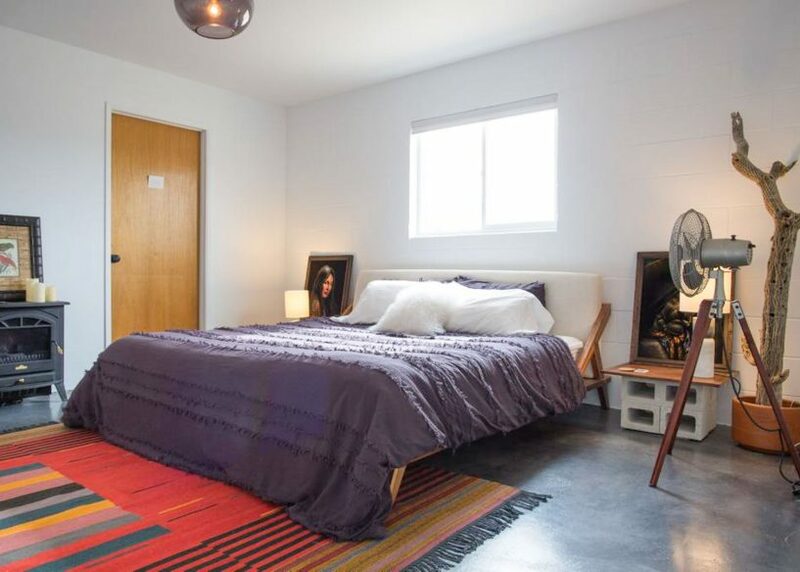 The home includes a queen-size bed, ac/heat, wood burning stove and an outdoor shower. 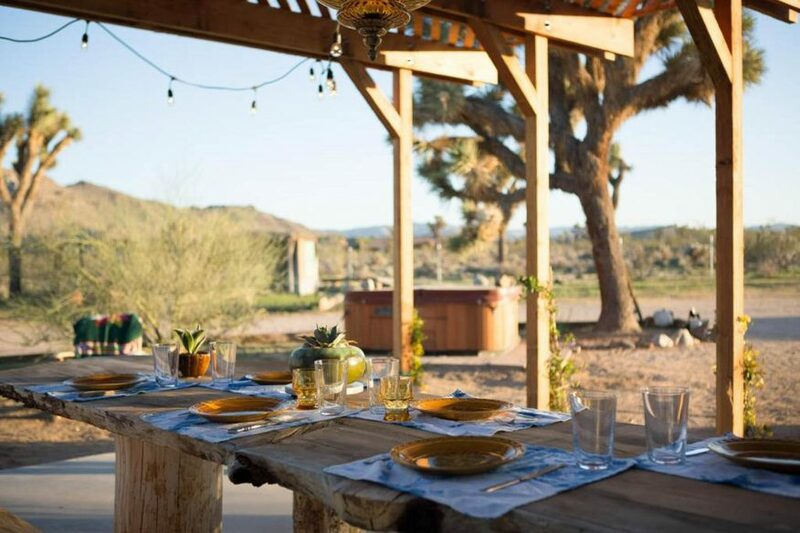 The Bell Cabin is part-run by a group called Homestead Modern who have a collection of over 30 homes around the Joshua Tree area, from rustic to full-on luxury. 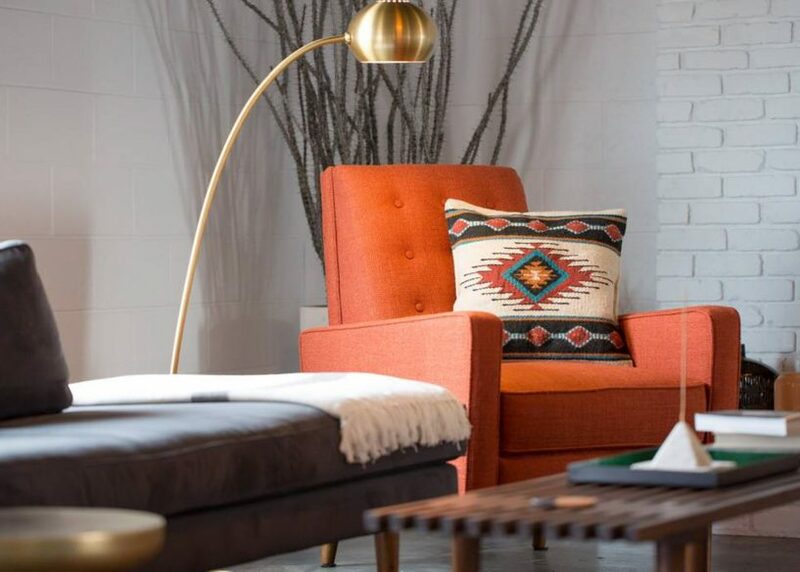 You can see all of Homestead Modern’s listings herehere. 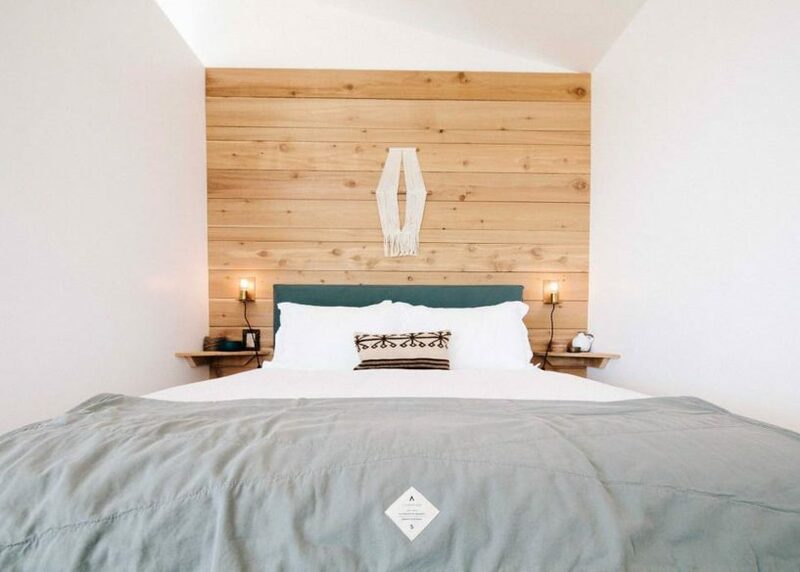 From all their listings, I chose the Bell Cabin as it’s one that has the most character. 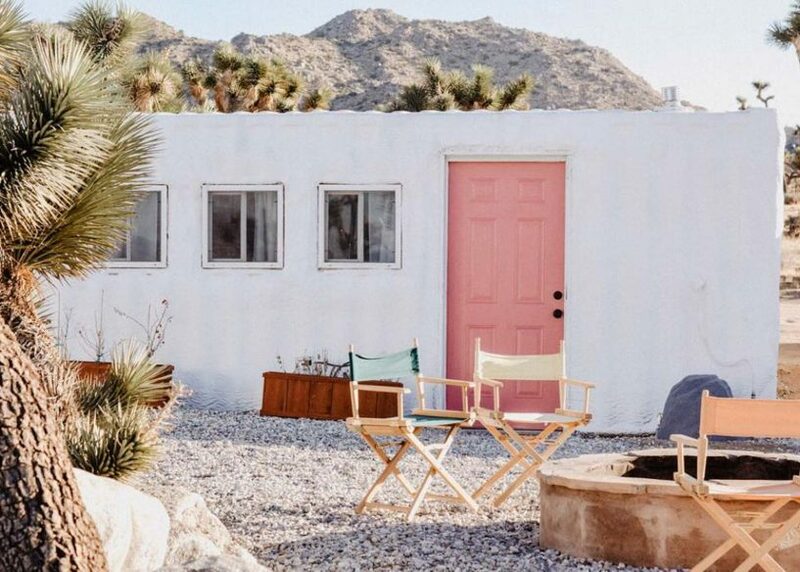 I particularly love the pink roof! 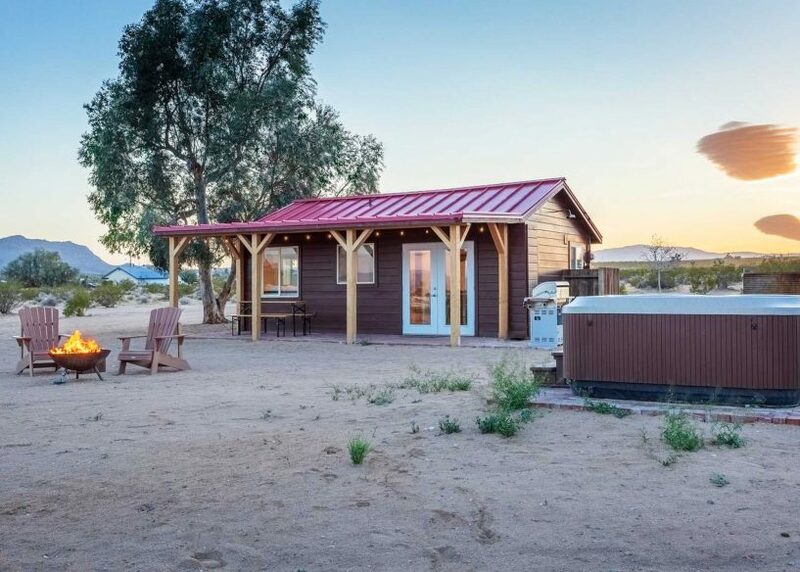 The studio cabin includes a large back patio for dining, a hot tub, outdoor shower, barbeque, fire pit and star gazing pad. 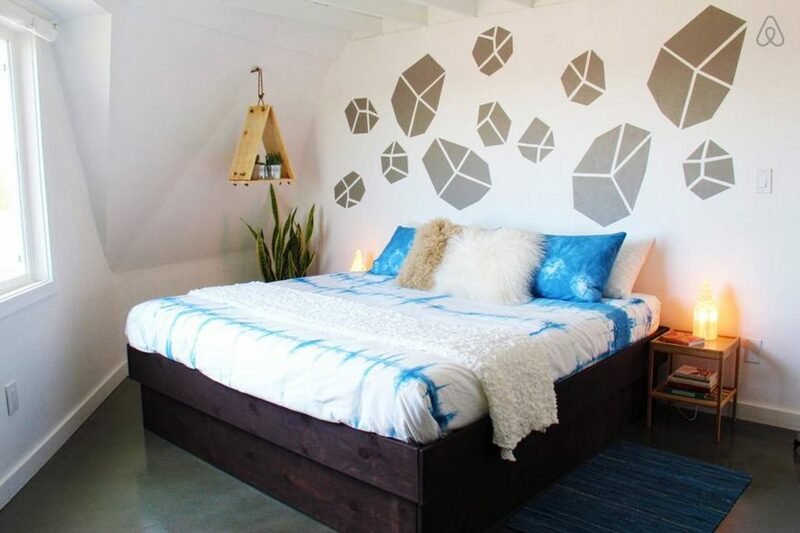 It was designed by Doug Wiand of House Hunters Renovation. 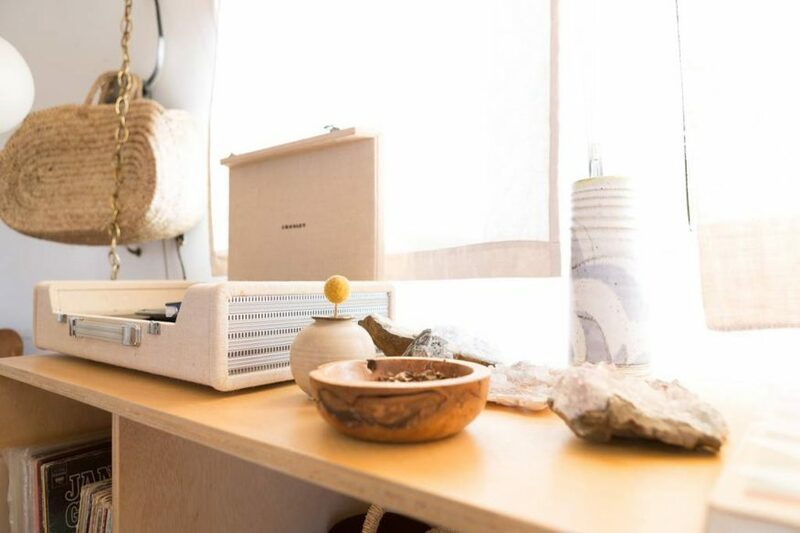 We fell in love with the tiny house movement in Portland where we stayed in the world’s first Tiny House Hotel. 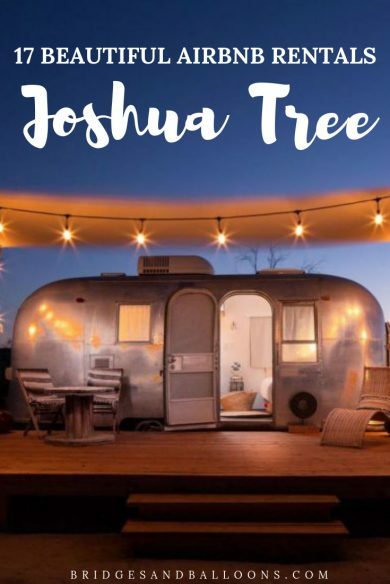 And you can experience tiny house living in Joshua Tree too. 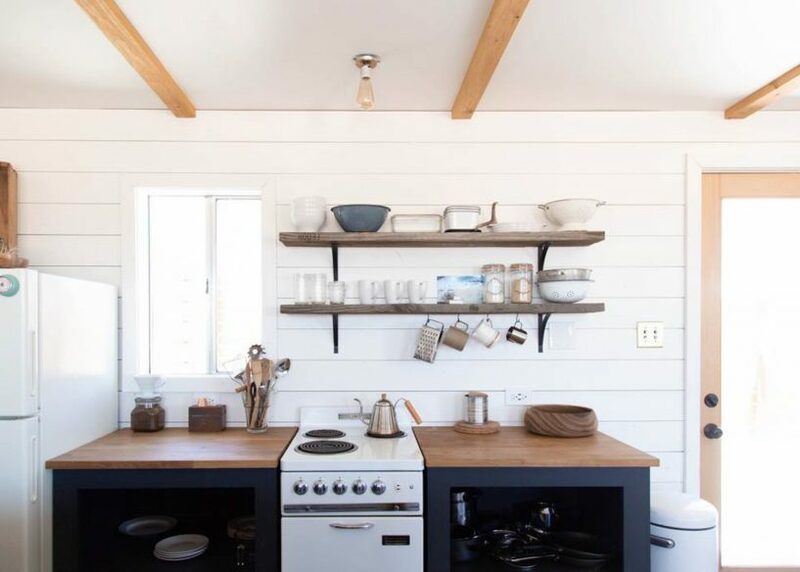 Set on a 20-acre property, the tiny house has two beds and a kitchen inside a super cute wooden cabin. The toilet is an adjoining outhouse. 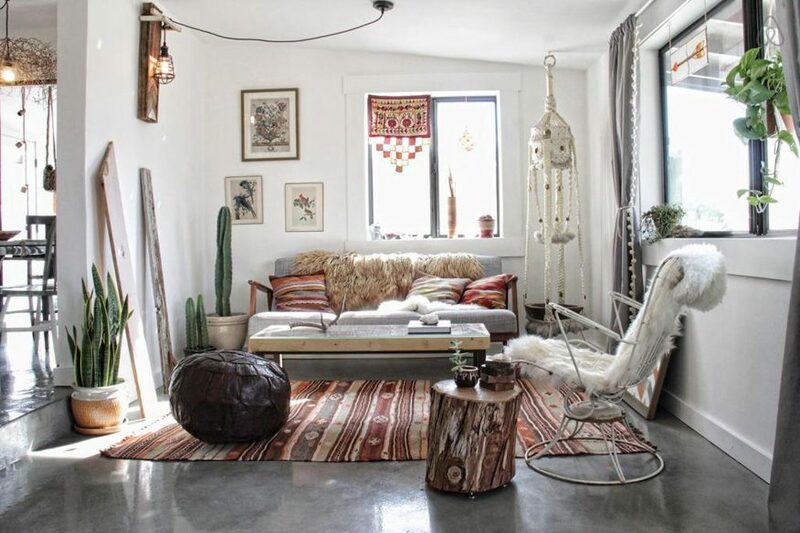 And a highlight is the idyllic porch swing. 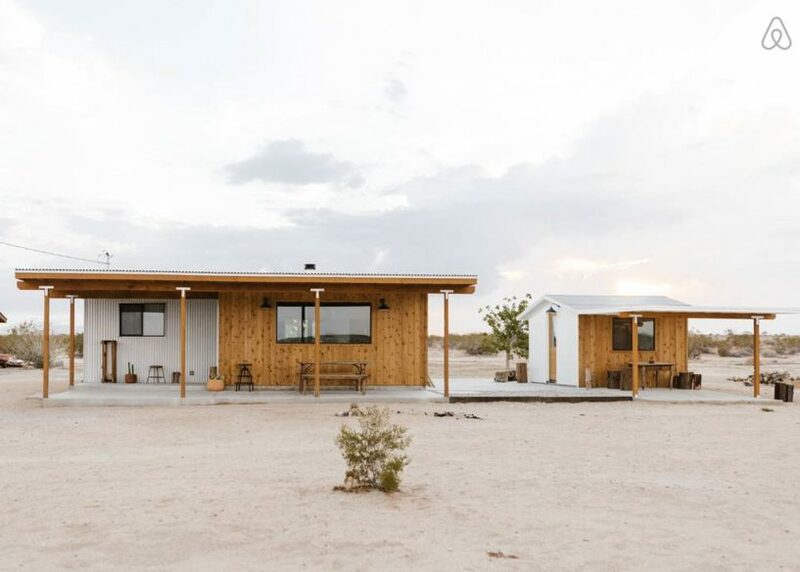 It’s off-grid, so there’s no electricity or running water, but that’s part of the appeal. 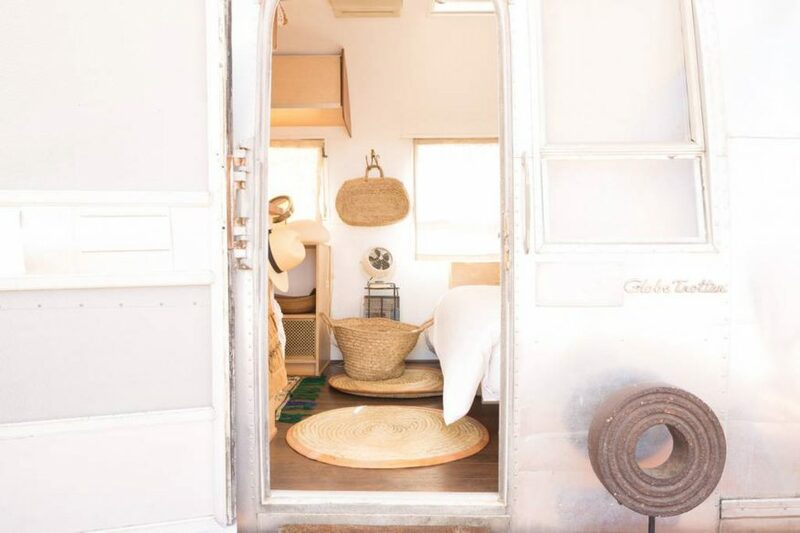 It’s a proper glamping experience. The grounds are called Boulder’s Hideaway and includes another three campsites. 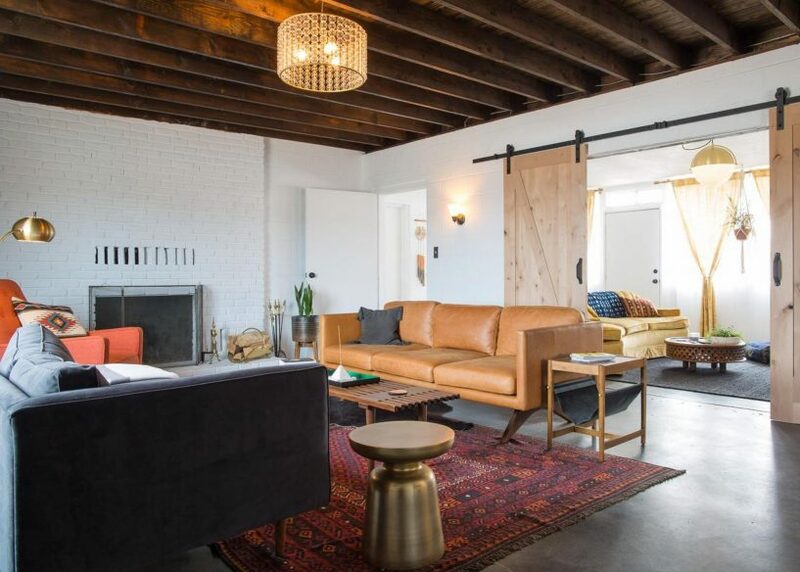 Remember you can use this link to get $25 off your first booking on AirBnB.